Mabuasehube Reserve (a part of the Kgalagadi Transfrontier Park) has some of the most remote Kalahari camping in Botswana. 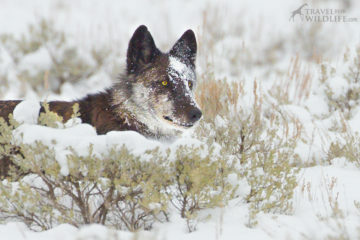 There are very few sites available so they tend to book up far in advance. 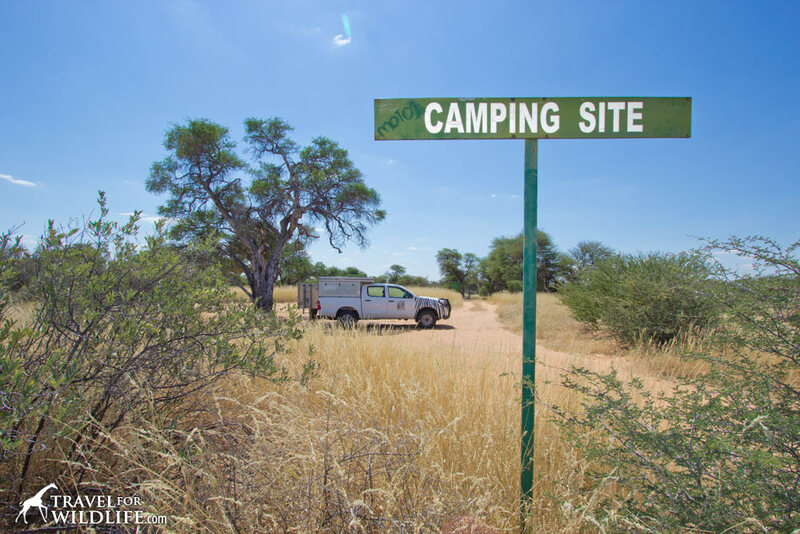 Yet there is virtually no information about the Mabuasehube campsites available online. 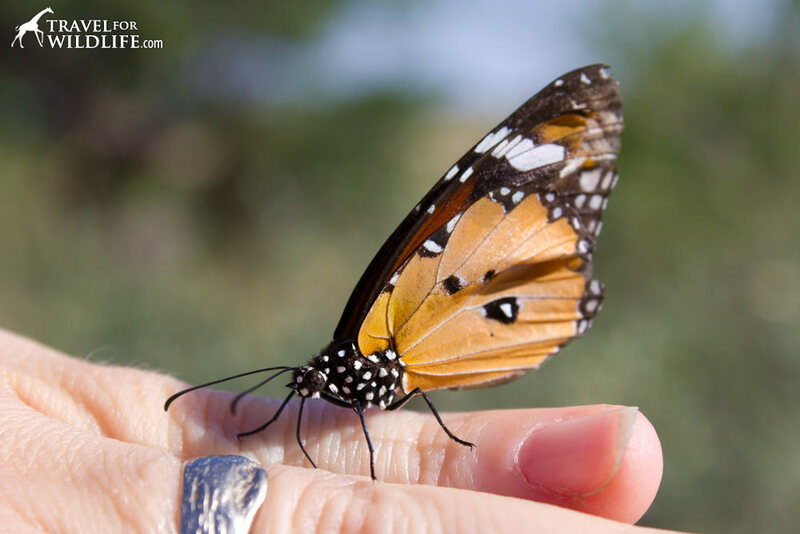 When Cristina and I booked our visit to ‘Mabua’, we knew nothing about the sites we picked, but I was determined to change that for future visitors. 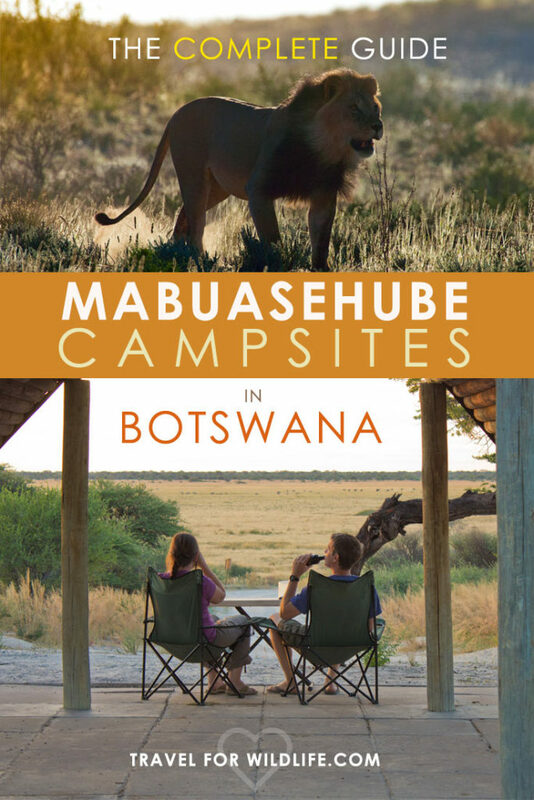 While we were there we visited every single site, photographed and catalogued all the facilities and created this complete guide to the Mabuasehube campsites. 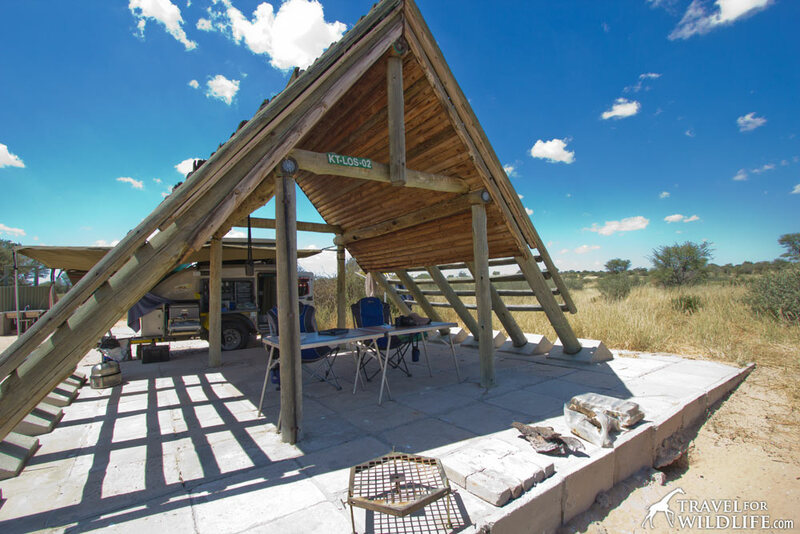 Once you’ve chosen your dream sites, make sure you read our companion article Traveling to Mabuasehube, Kalahari Camping in Botswana and learn everything you need to know about camping in Mabua including how to book your sites and how to get to Mabuasehube. 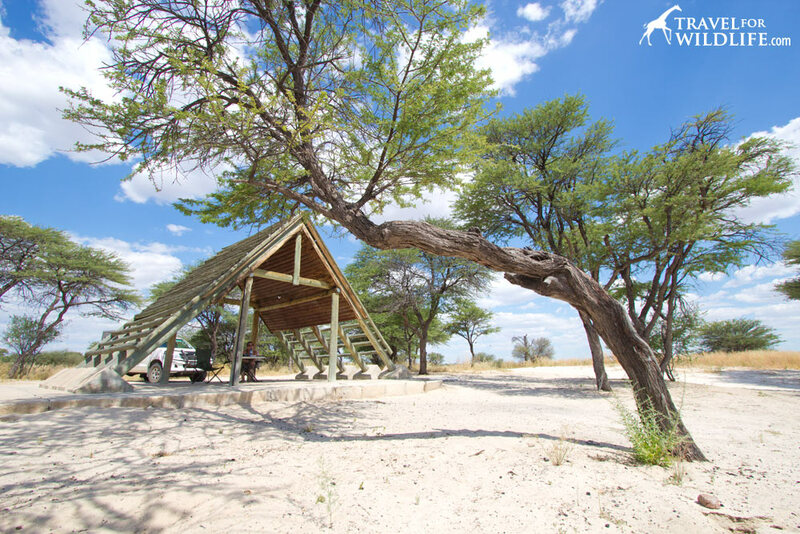 There are seven camps in Mabuasehube, each with two to four individual sites, totaling just 17 campsites in the entire Mabuasehube reserve. If you’re looking for solitude, you’ve come to the right place. 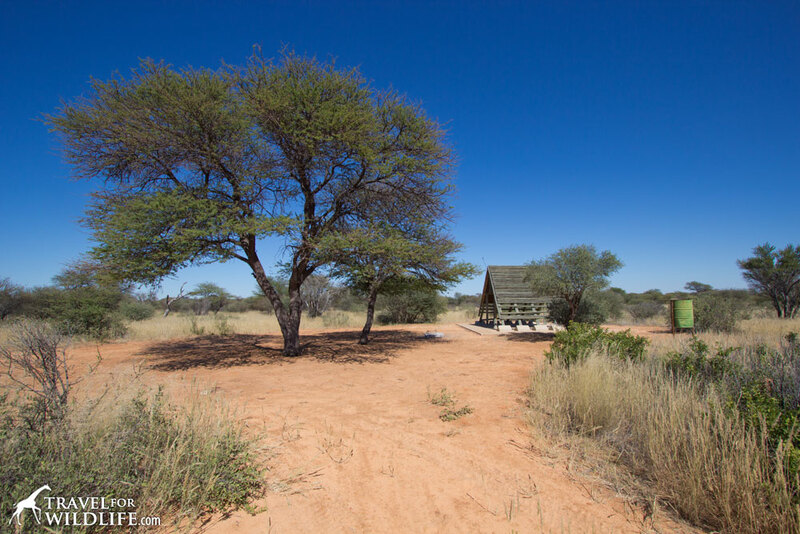 The camps are named for the pan they sit next to (except for Entrance Gate.) 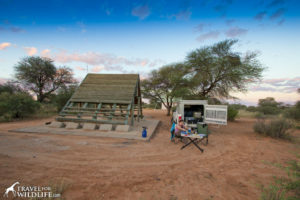 Can’t get enough Kalahari camping in Botswana? 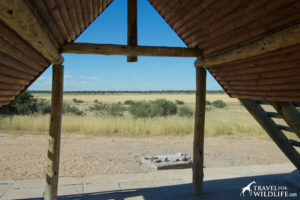 Then be sure to check out our other article Visiting the Central Kalahari Game Reserve in Botswana. 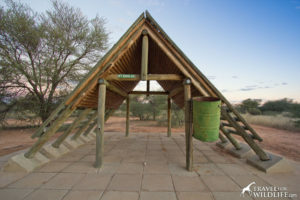 The list of campsites below is divided into two sections, the park-managed camping sites and the privately-managed campsites (Mpayathutlwa and Mabuasehube camps). 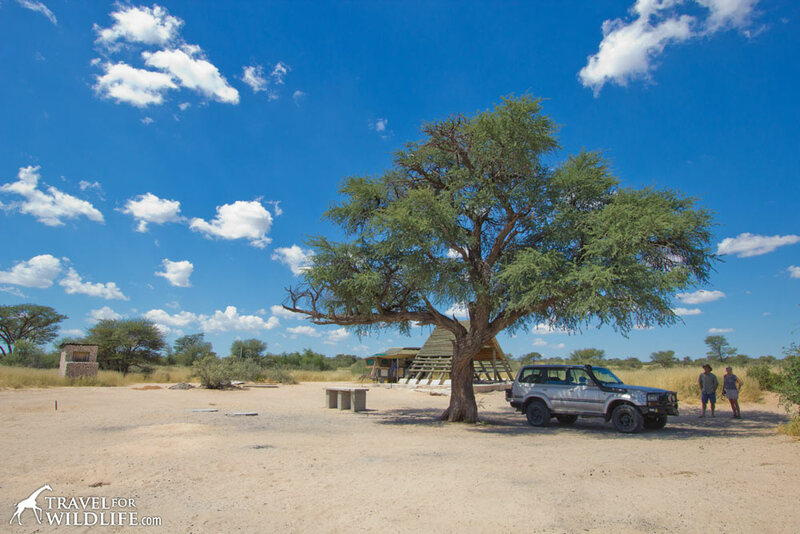 You can find more detailed info about Mabuasehube Reservations in our companion article Traveling to Mabuasehube, Kalahari Camping in Botswana. 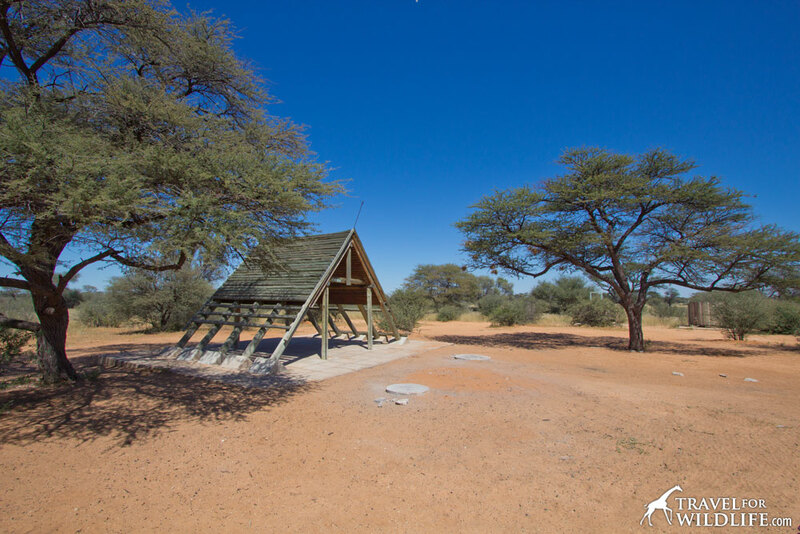 The campsites at Mabuasehube have a wide variety of facilities ranging from nothing but a tree, to functioning showers, sinks and toilets. 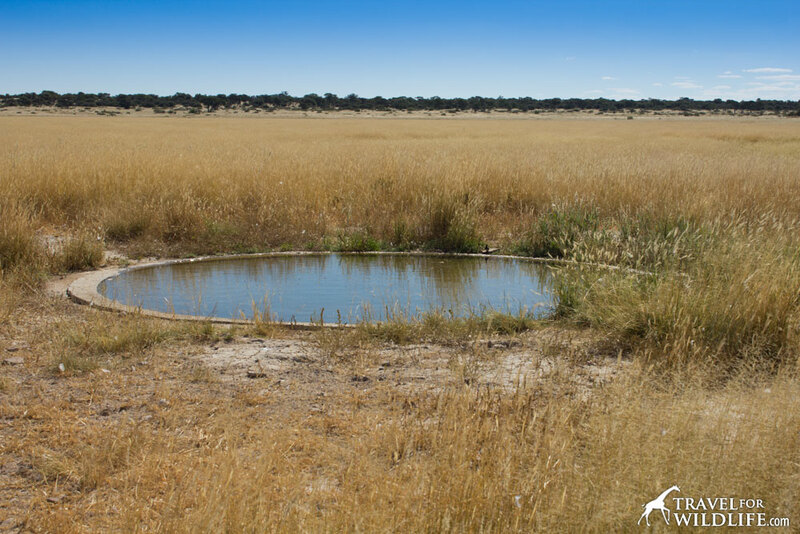 Keep in mind that although several sites have water available, it may not be suitable for drinking. 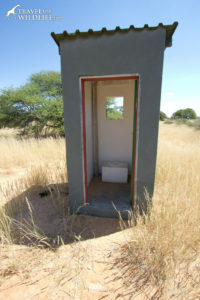 For example, people at Mpayathutlwa sites often report it is too salty to drink. 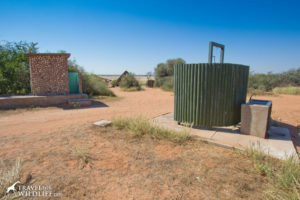 Every site has a trash barrel and a campfire pad. For that reason I don’t list those in the facilities for each site. 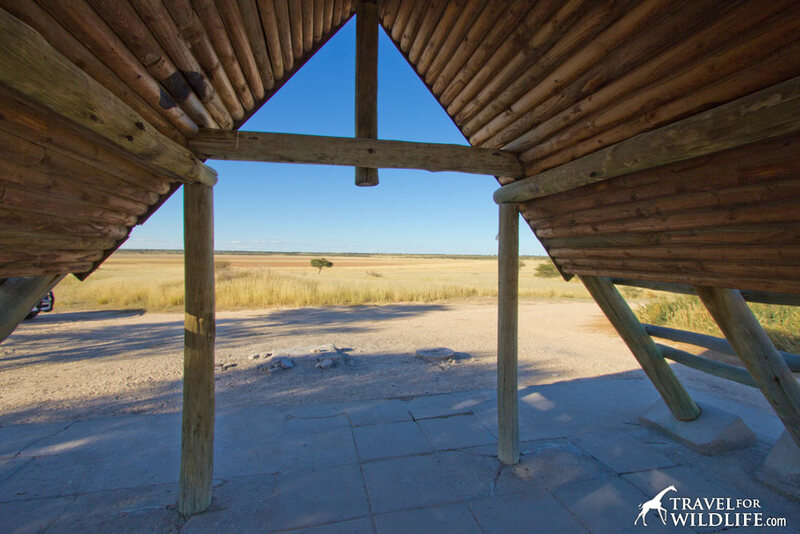 The largest structure at each site is the beautifully-constructed A-frame shade shelter with a concrete pad beneath it. There is one site that doesn’t have an A-frame (Mabua 1) so I do include that in the facility lists. 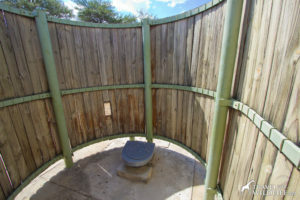 There are also some nicely-constructed spiral enclosures for outdoor showers and for pit toilets (often referred to locally as a “long-drop”). These are the “spirals” I refer to in the information below. 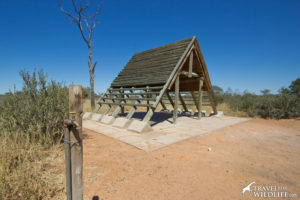 Note that water is sometimes available at some sites. In the table below we show which sites had water when we visited. This does not mean there will always be water. 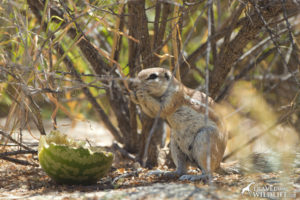 Therefore you must always plan to be totally self-sufficient and bring all the water you will need. And also I’d like to throw in a quick thanks to Zebra Camper Hire for helping to make this trip possible for us. 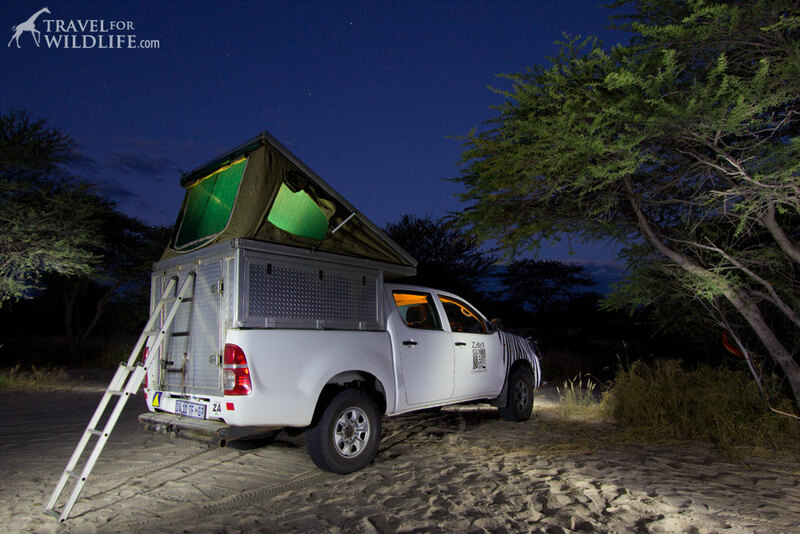 Below is a pic of us setting up camp for the night in our Zebra camper at Bosobogolo 1 . 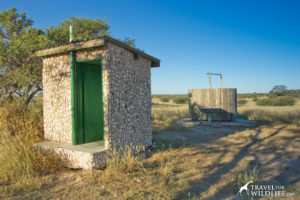 You need to be self-sufficient in Mabuasehube, but having a toilet and a shower at your campsite sure is a nice treat. 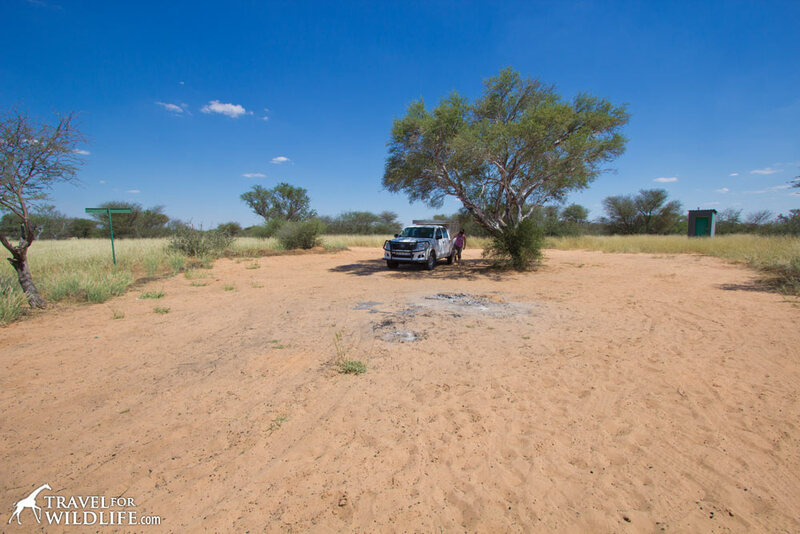 IMPORTANT: CAMPSITES MAY NOT ALWAYS HAVE WATER! These sites had water when we visited, but boreholes dry up and pumps stop working. Always assume there will be no water and bring all the water you may need! 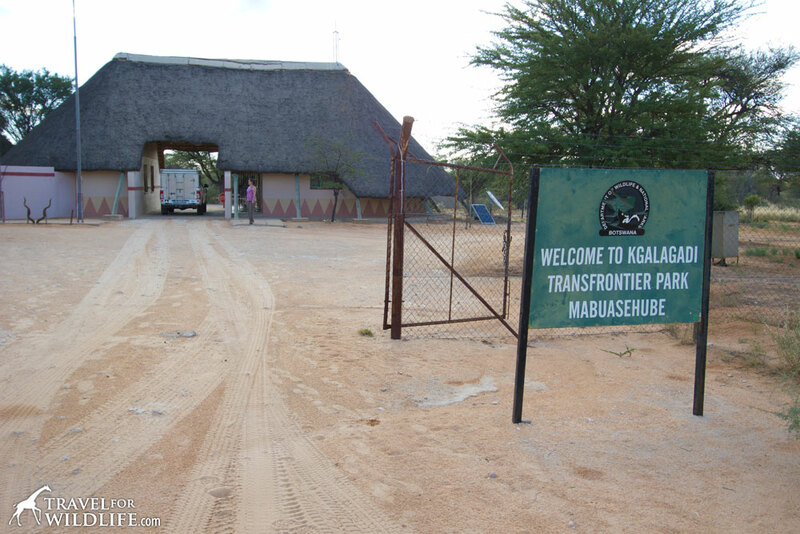 It’s hard to find a decent Kgalagadi Transfrontier Park Map, especially with good details of the Mabuasehube area. 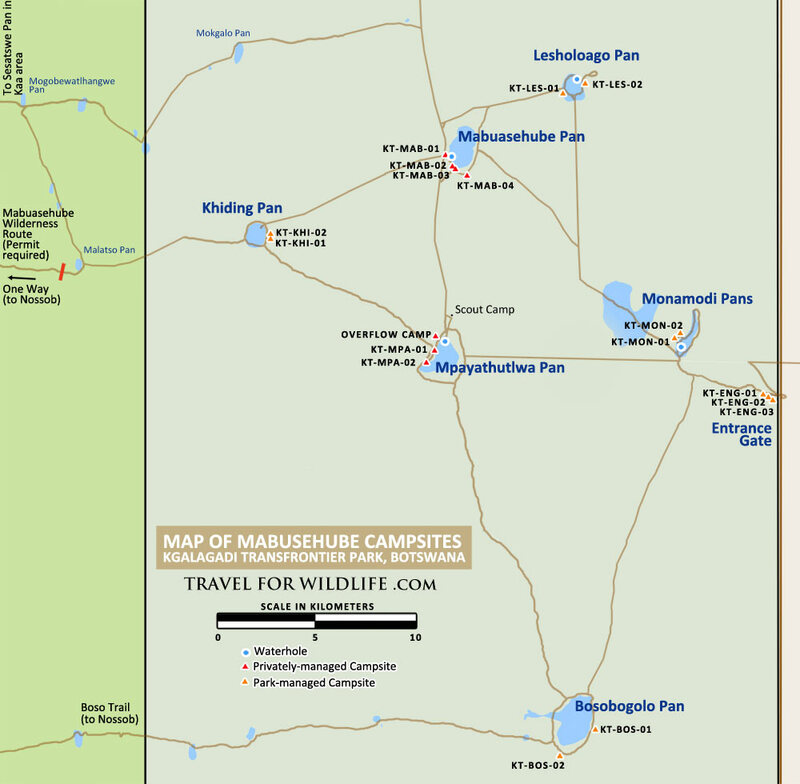 That’s why I’ve created this Mabuasehube Kgalagadi Map that shows the locations of all the Mabuasehube campsites. 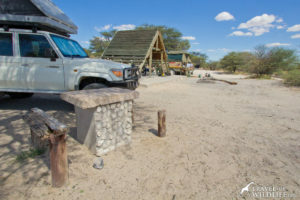 Since this is a long post, you can use this table of contents to jump straight to a section or campsite you want to check out. At the end of each section you can click “top” to jump back here. The Entrance Gate campground is a great choice on your way in or out of the east side of Mabuasehube. 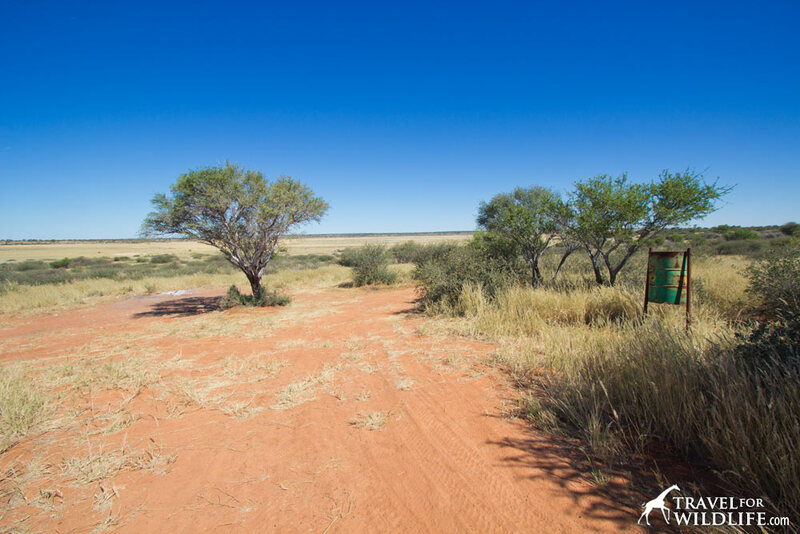 This is where you’re most likely to enter the park unless you drive across the Boso Trail from Nossob on the South Africa side of the Kgalagadi Transfrontier Park. 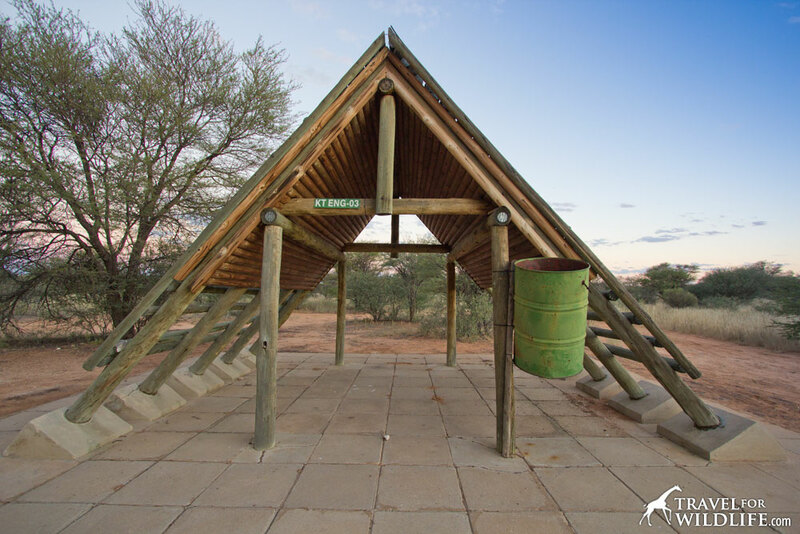 These campsites are just inside the entrance gate so it’s a convenient place to stop after a long day of driving. 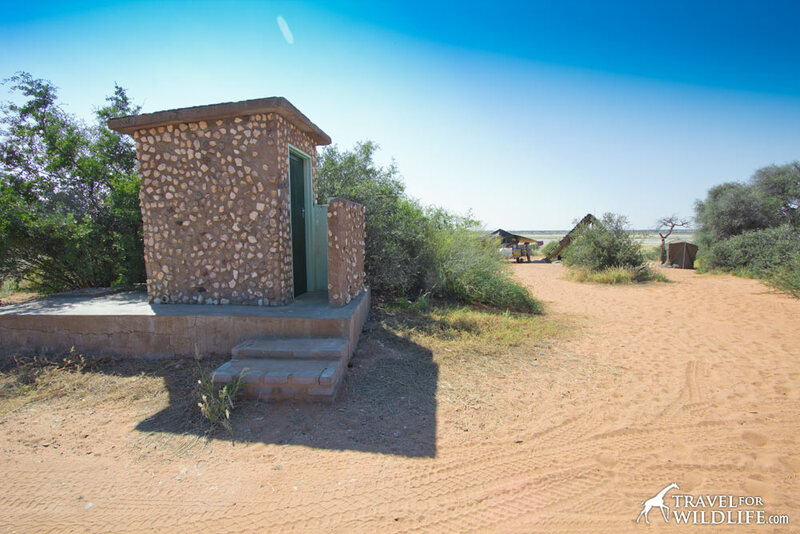 It’s also the only place in Mabua with park staff, flush toilets, and indoor showers! 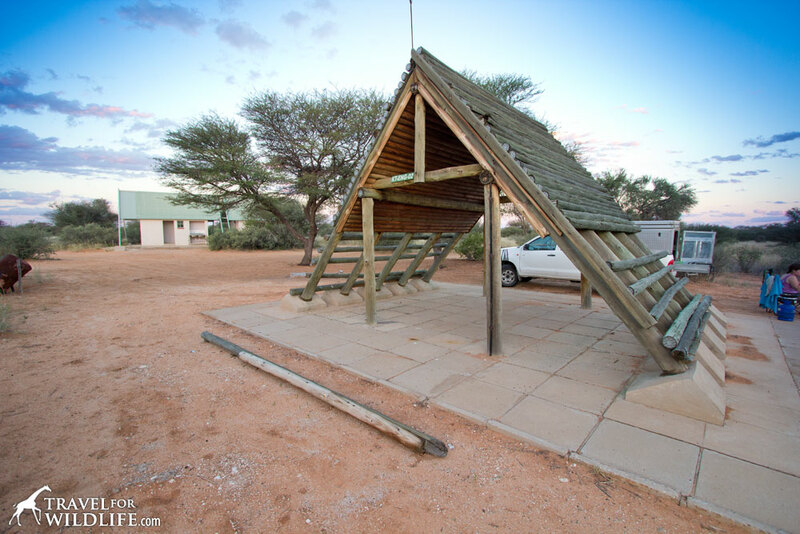 The ablutions building is shared between the three campsites. 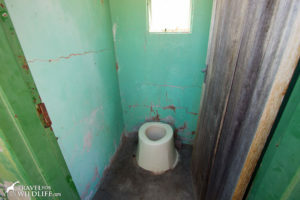 The men’s and women’s rooms each have two shower stalls but the plumbing on the men’s side is severely rusted and damaged and there were no shower heads at the time of writing (you can still stand under a stream of water). Cristina told me the shower heads were fine on the women’s side and she had a great shower. 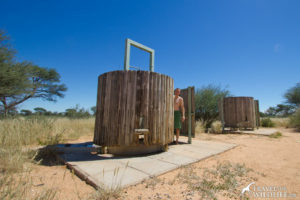 Keep in mind the pump is solar-powered and you won’t get any water after sunset. 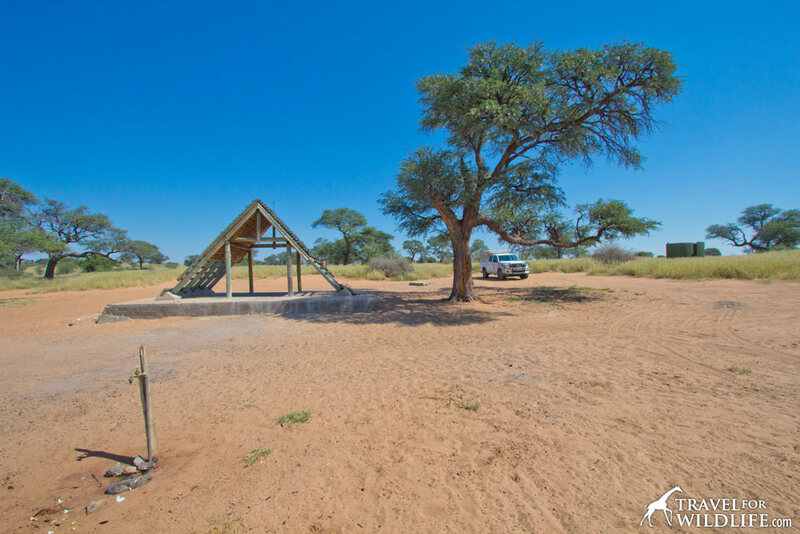 The shared ablutions building for the Entrance Gate campsites in Mabuasehube. 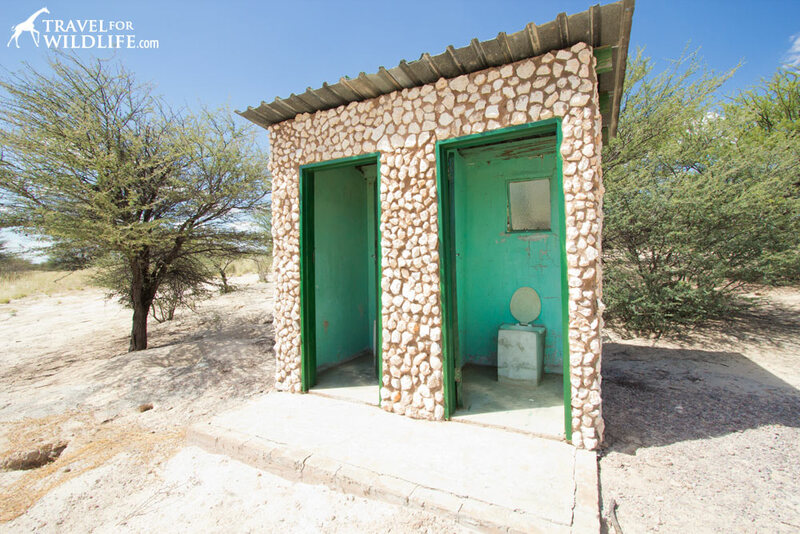 Showers and toilets and sinks! 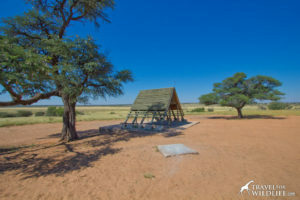 The three campsites are close together (about 60 meters) so don’t expect a whole lot of privacy or a feeling of solitude. You can definitely hear your neighbors from any of the sites but there are a few bushes and trees in between to give a little bit of visual privacy. Keep in mind there are no views here and no neighboring pan to watch wildlife. 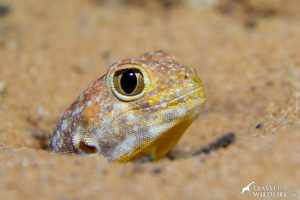 On the other hand, there are tons of barking geckos (more than the other sites we stayed) so it sounds wonderful in the evening. 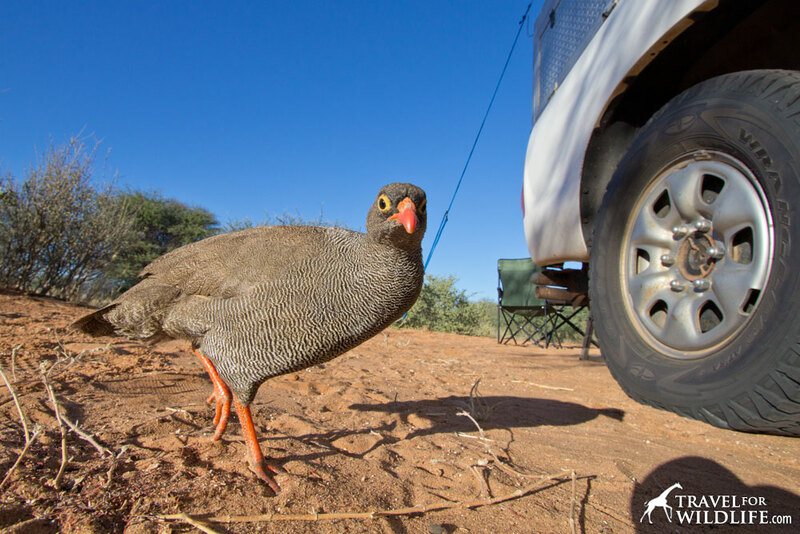 We also had the usual visits from francolin and mongooses and saw plenty of hyena tracks all around our site. 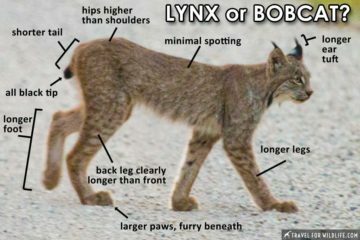 You may also discover decapitated rodents and pellets in the bathrooms from an owl who likes to perch on the edge of the open windows. Our favorite site at Entrance Gate is number 3 because it is a little farther out from the others and at the end of the access road so nobody will be driving through your site or walking through it to get to the bathrooms. Site number 1 is a close second. Reception staff at the Mabuasehube entrance gate. 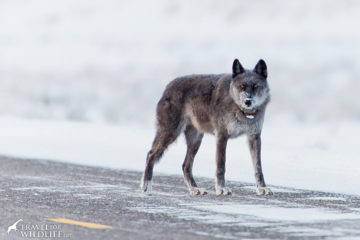 Notes: It’s the first one you pass coming into the access road to the sites. Fairly private because at one end of the three sites. Notes: This is our favorite site at Entrance Gate because it’s a little farther away from the other sites and at the end of the access road. I think Monamodi may be the most under-rated camp in the park. 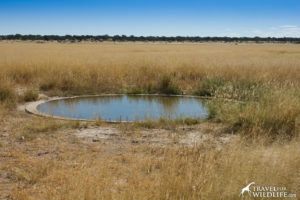 It seems to be a little-known fact that there is a waterhole at Monamodi. I rarely see it mentioned or listed on maps. 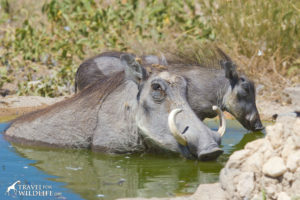 But the Monamodi waterhole is one of our favorites in the park. The bird activity here is incredible. 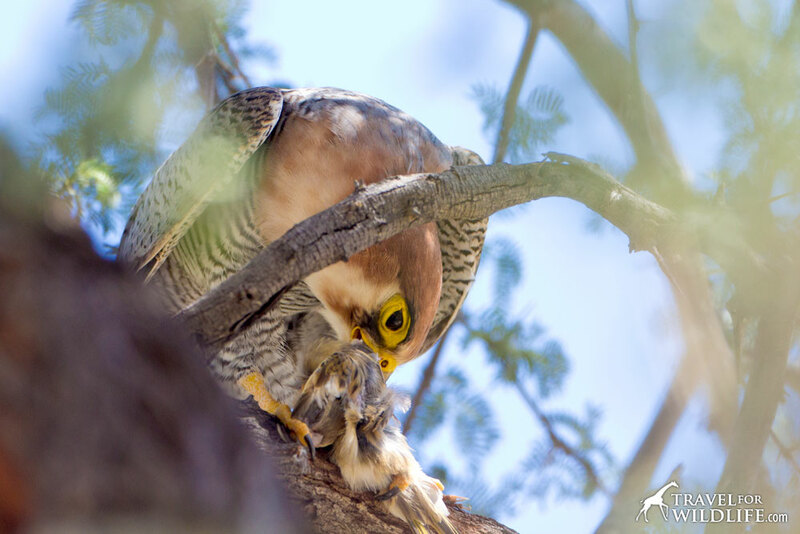 The flocks of turtle doves are enormous and the Lanner Falcons stay busy hunting them. 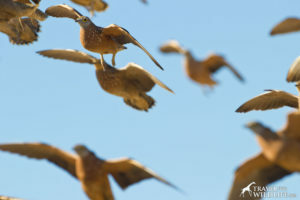 The sandgrouse activity is spectacular. We saw Lappet-faced Vultures daily and a pair of Bateleur Eagles drank just meters away from us. 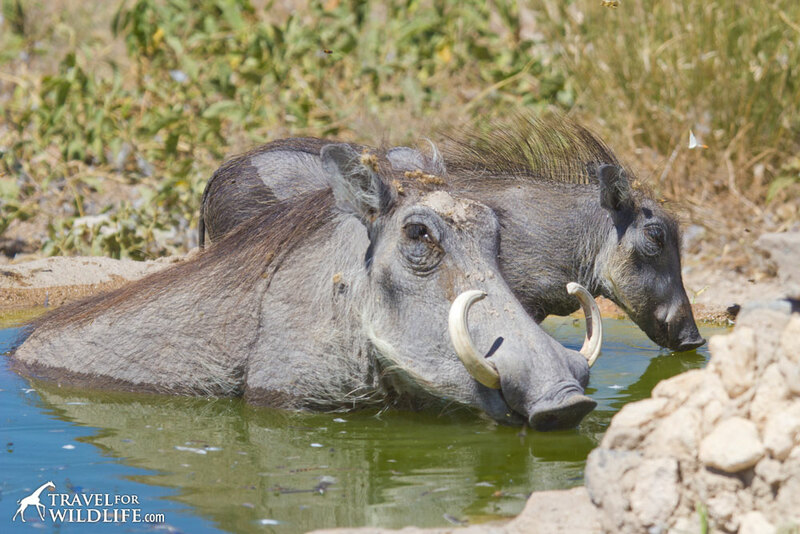 We also watched a mother and baby warthog bathing right in front of us, as well as a lone hyena bath. Though there are relatively low numbers of antelope (occasional wildebeest, hartebeest, springbok, gemsbok, and steenbok) the other sightings more than made up for it. The two campsites are more than 300 meters apart so you definitely won’t hear or see your neighbor. 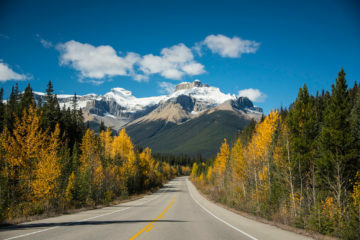 Each has its own access road but a back road connects the two. Our favorite campsite at Monamadi is site 2. 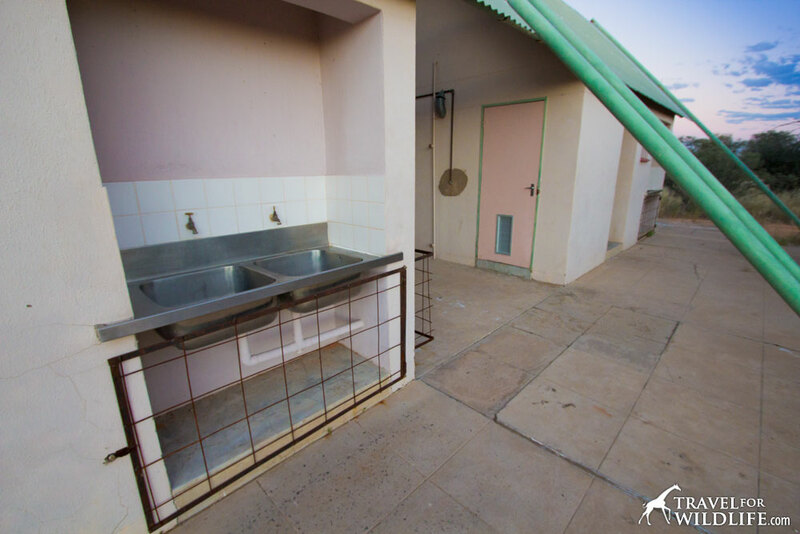 Though it has less of a view, it has all the facilities you could want including a functioning shower and sink! Monamodi Campsite 1 (KT-MON-01) in Mabuasehube. Notes: Although this site has far fewer facilities than the Monamodi 2 campsite, it does have a water spigot which is a great bonus. 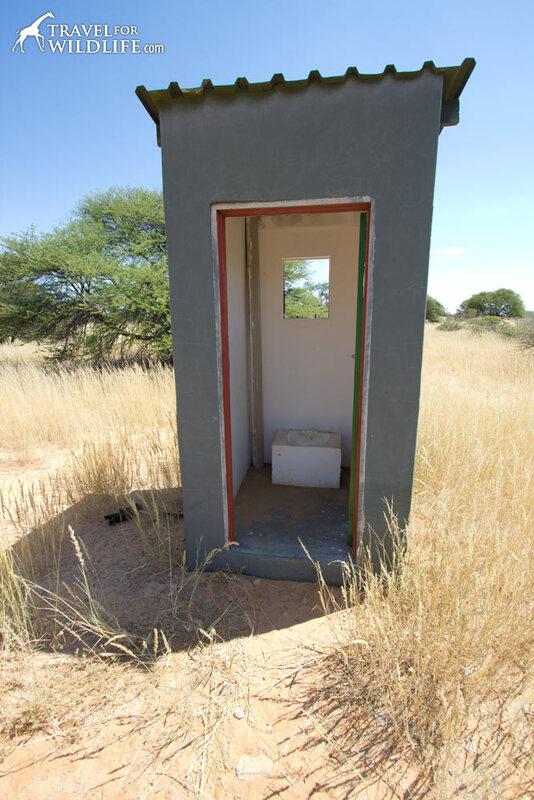 However, having no toilet is a major downside. You have to be prepared to dig your own hole. We stayed here a few nights and luckily nobody was staying in Monamodi 2 so we used the toilet there. 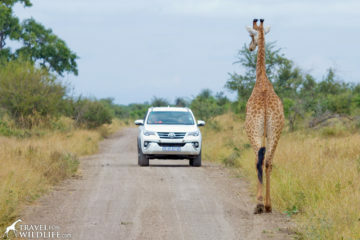 However, this site is conveniently close to the awesome Monamodi waterhole making for very short drives to visit it. 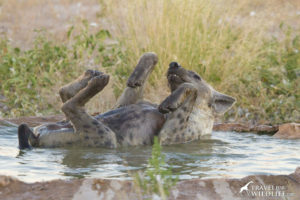 We also had some exciting hyena activity in camp and got to watch him take a bath in the waterhole. 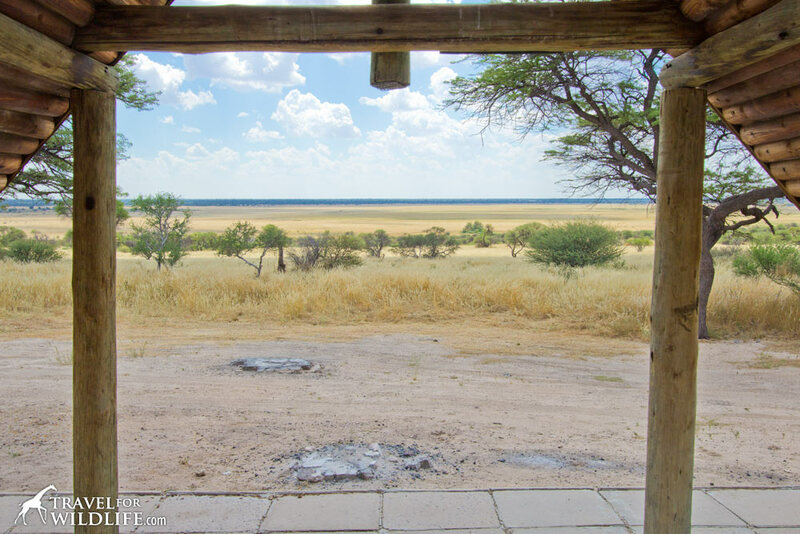 Notes: Other than its general lack of pan views, Monamodi 2 has it all. 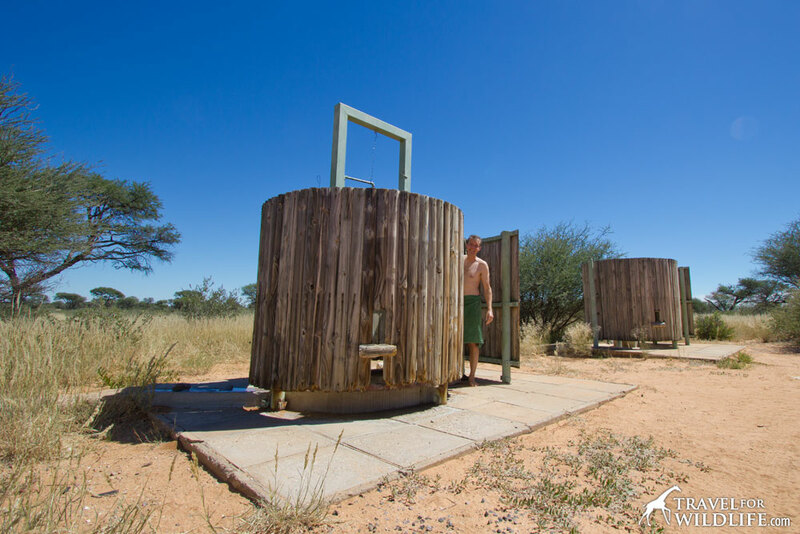 This large site has functioning water in both the shower (complete with shower head!) and the wash basin. There is a busy colony of white-browed sparrow weavers in the central shade tree and plenty of ground squirrel activity. 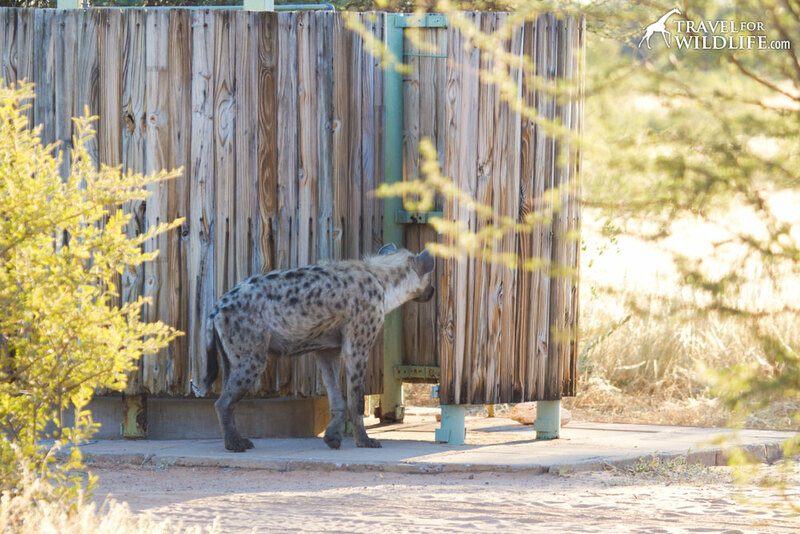 We also had a visit from a lone hyena (who was perhaps a little too bold) who eventually went down to the nearby Monamodi Waterhole for an adorable bath right in front of us. A spotted hyena visits the shower enclosure at the Monamodi Pan campsite in Mabuasehube, Botswana. 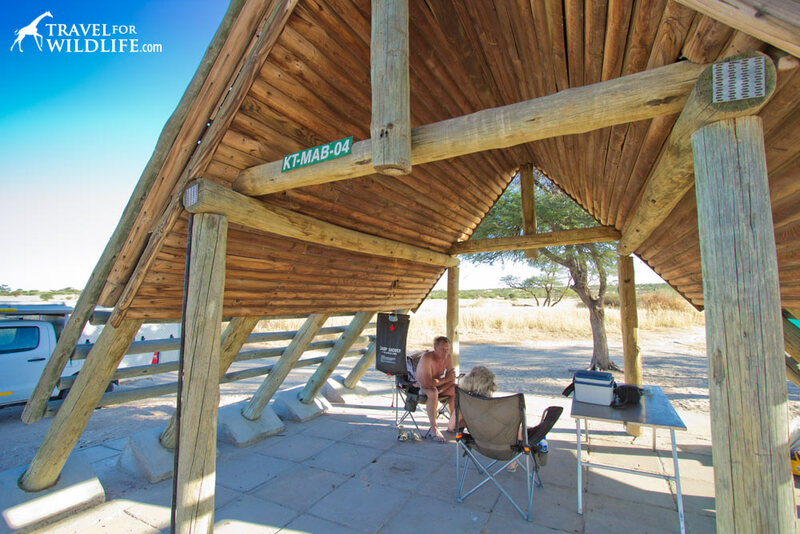 The Lesholoago camping area has only two sites located on opposite sides of the pan (more than a kilometer apart) so if you’re looking for solitude, you’ve found it. Occasionally referred to as “Lesho”, you will notice inconsistencies in the spelling of this pan. 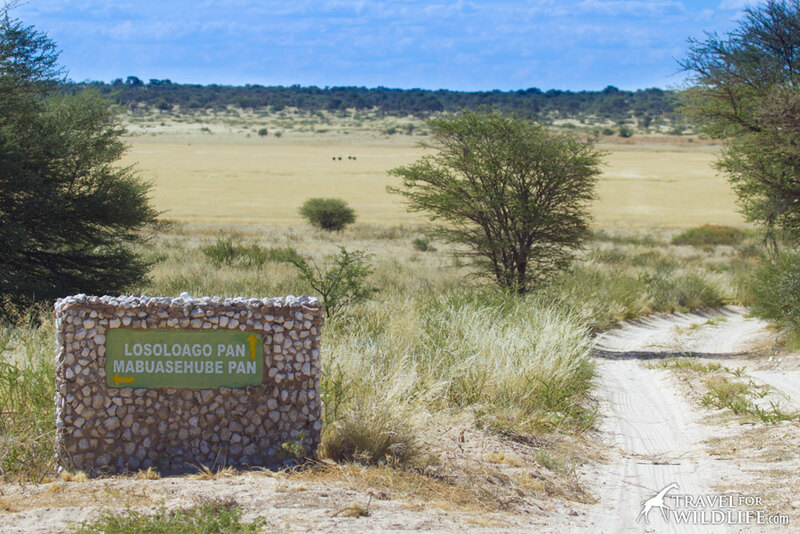 The sign leading to the pan (in the photo below) spells it Losoloago Pan, but the official park map spells it Lesholoago Pan. To add to the confusion, it seems one campsite’s code is KT-LES-01 and the other is KT-LOS-02. 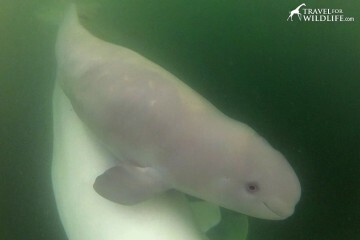 Whatever spelling you use, Lesholoago 2 tends to be the favorite site of regular visitors, and for good reason. The campsites are far apart, the pan has a nice waterhole with plenty of animals, and there is regular lion activity in the area. Our favorite campsite at Lesholoago is site 2. 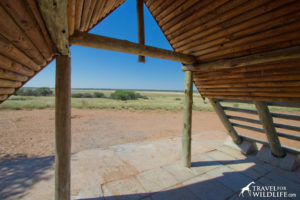 It has far more facilities than Lesho 1 (including running water in the shower and sink), a stone outhouse, a concrete table, nice views, and close proximity to the waterhole. 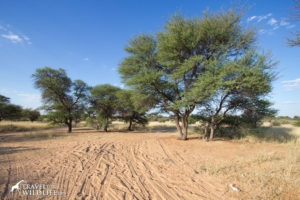 Notes: The main downside of this site (besides its lack of water or a shower enclosure) is that there are no shade trees within the site. There is one good shade tree just outside the site but if you park under it your vehicle will be a bit far from the A-frame. 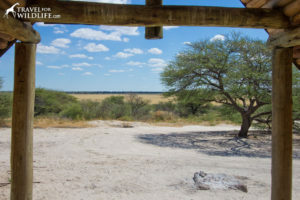 The upside is that the view of Lesholoago Pan is really nice and it’s one of the most secluded sites in Mabua (a kilometer away from the other Lesho site.) 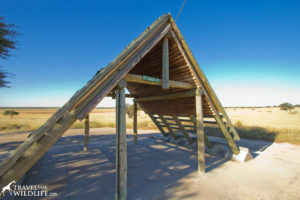 Also note that this A-frame is not labeled with the site name (KT-LES-01) like most are, but it does have an old green sign post at the entrance that says “GL-1”. Notes: Lesho 2 is a pretty sweet site. 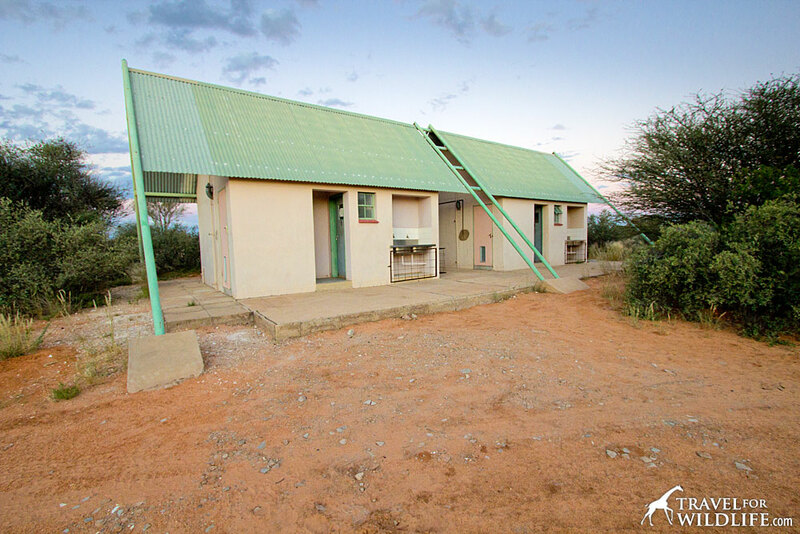 Not only does it have running water, including a shower with shower head and a functioning sink, but the toilet is in a cute little stone house which keeps you out of the sun and lions can’t walk in on you. 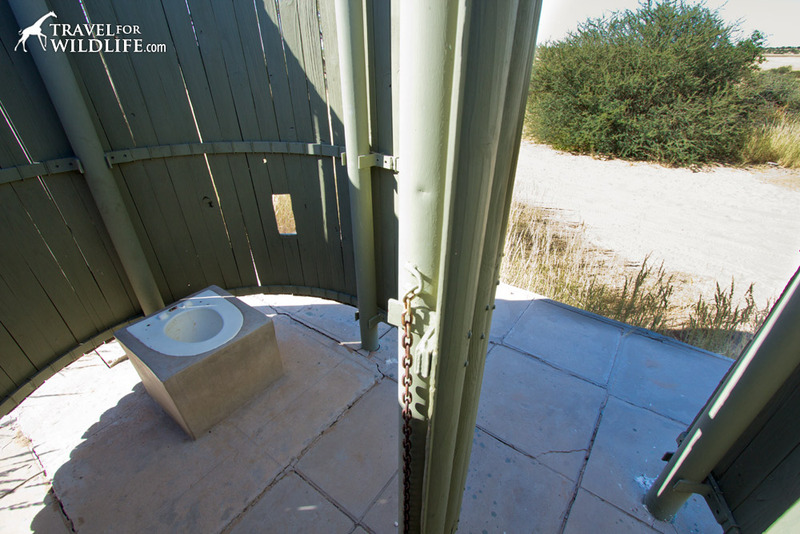 (Though Cristina thinks its gross inside and says she’d rather have the open air spiral enclosure.) It also has a concrete table under the shade tree (the bench seats were under construction when we saw it) and good views of the pan. But probably the best part is that it’s quite close to the Lesholoago waterhole and your odds of having lions walk through your camp are pretty good. 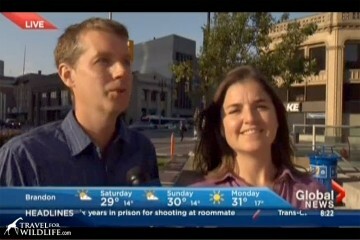 In fact, the morning we took these photos, that’s exactly what happened to the folks staying in it. The A-frame has a nice view of the pan. Working shower, basin, and stone outhouse! Khiding Pan has a reputation for good lion activity. 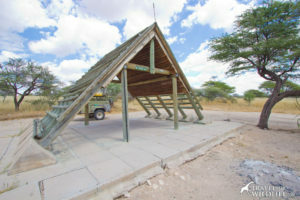 You’ve probably seen the famous youtube video of lions licking water off the side of a tent while the campers were still inside. That was filmed here in Khiding. The drawbacks to Khiding are that there is no waterhole (and therefore no water in the sites) and the two campsites are quite close together (only 80 meters between A-frames.) Although you won’t see your neighbor, you are likely to hear them. 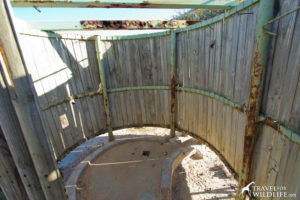 The shower spiral enclosure has no plumbing or water and is shared between the two sites. (You can hang a shower bag in there if you want to.) It’s kind of hard to explain the layout so I made this map to give you a better idea of how it works. Although Khiding has no waterhole, you can still spot plenty of wildlife. 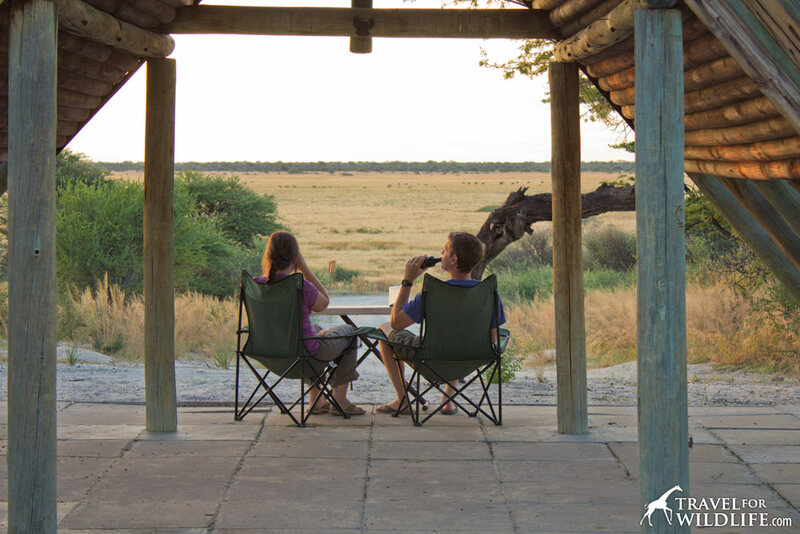 Large herbivores like wildebeest, gemsbok, springbok, and hartebeest graze in the pan, which is of course why lions are in the neighborhood. 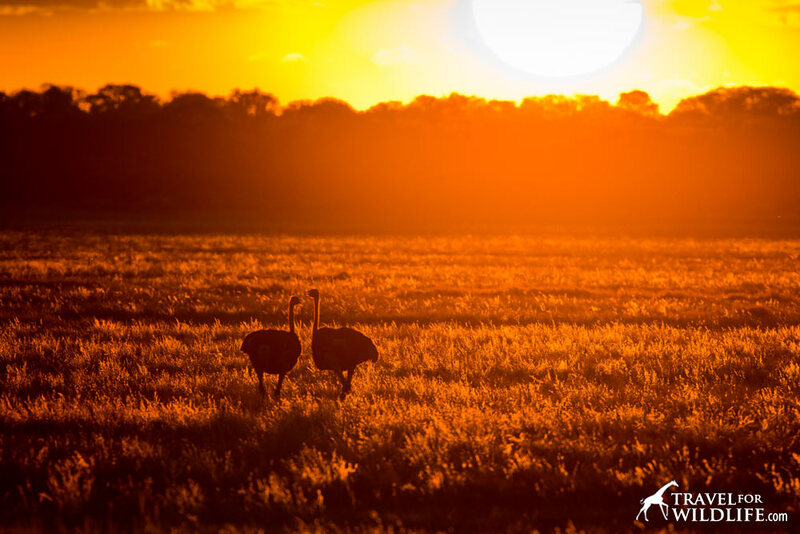 And like every pan in Mabua, you can always find ostriches, even in the heat of the day. Our favorite campsite at Khiding is site 1. 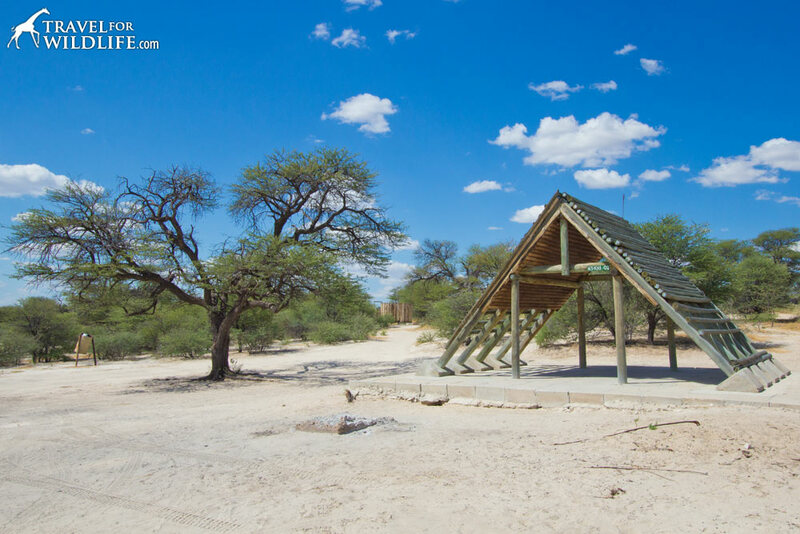 It’s a larger site, has two stone tables (but no functioning benches when we visited) and it is the only site in all of Mabuasehube with the grand luxury of two pit toilets in a stone double outhouse! Notes: Khiding 1 is a very large site, nice if you have a group of people or multiple vehicles. It is also the only site in all of Mabua with two toilets of its own (also good for groups!) On top of that it has two stone tables (also something that no other site had at the time of writing) though there were no bench seats at one table and only one damaged bench seat at the other. You can bring your own folding chairs of course but you’ll probably feel like a munchkin sitting at the tall tables. 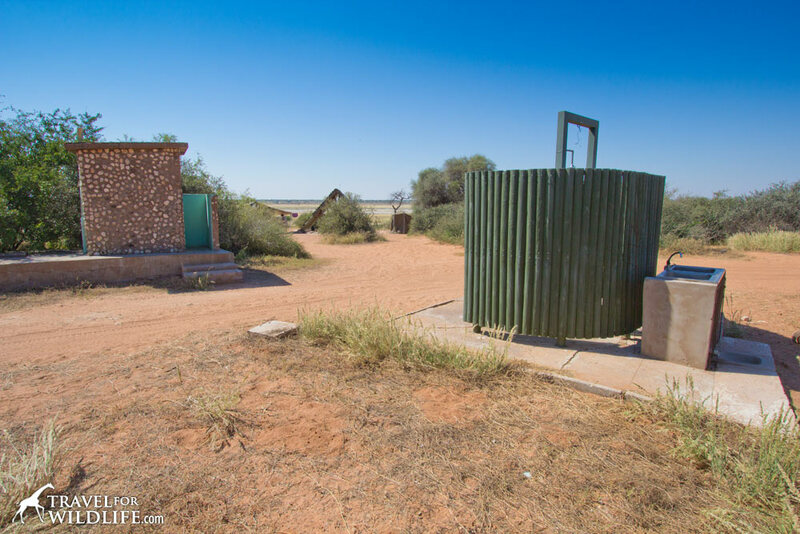 The bad news is that there is no water at either of the Khiding sites, they share a shower enclosure (with no water), and they are quite close together (80 meters between A-frames). You are likely to hear your neighbors here, but not see them. 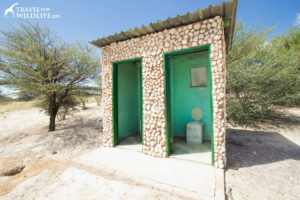 The only site in Mabua with two toilets! Notes: Khiding 2 has nice views of the pan but is a little weak on shade trees. Like Khiding 1 it has no water and shares a non-functioning shower enclosure with the other. This smaller site is a little cozier than site 1 but again, they are pretty close together so even if you don’t see your neighbors, you’ll probably hear them. 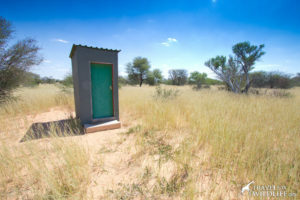 Bosobogolo (sometimes referred to a “Boso”) is isolated even by Mabuasehube standards. 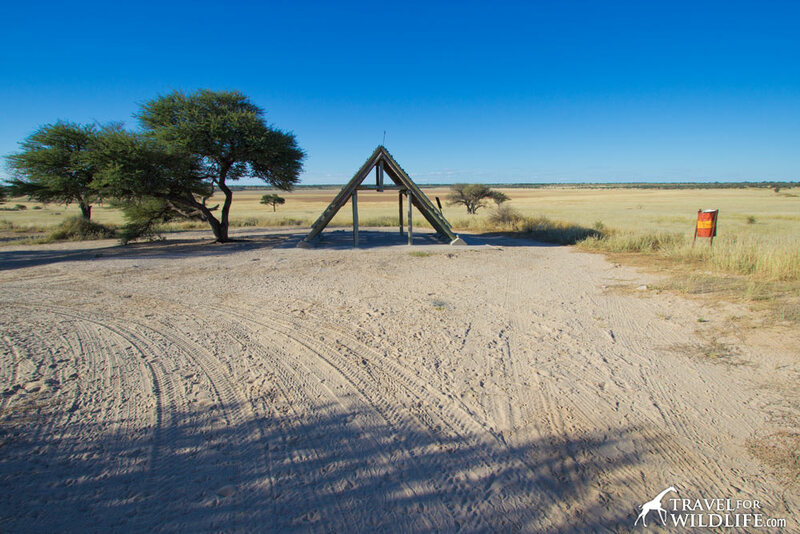 It sits farthest from all the other pans and only has two sites which are more than two kilometers apart, making these the most isolated camping sites in Mabuasehube. 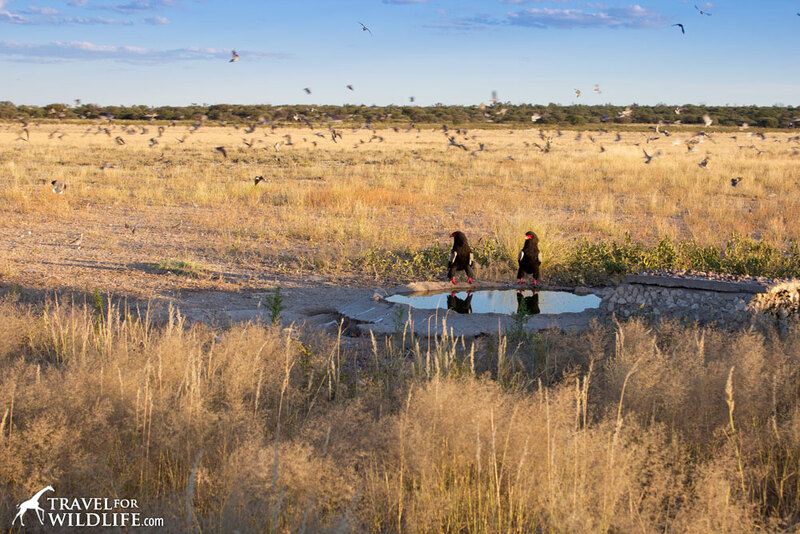 The pan has no waterhole but plenty of wildlife. 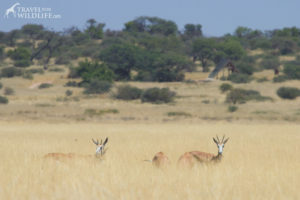 Gemsbok, wildebeest and springbok are common in the pan and there are loads of ostriches. While we didn’t hear any lions roaring, there were plenty of hyena whoops. But the biggest treat was the wide diversity of small birds that visited our camp. Our favorite campsite at Bosobogolo is site 1. 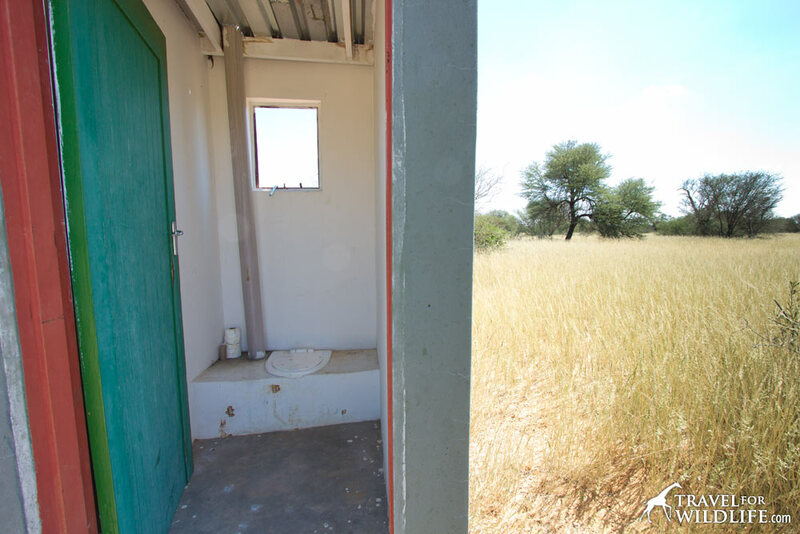 While the view at site 2 is a little better, this one has a toilet making it the obvious choice! 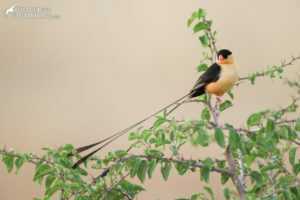 Bosobogolo has lots of wildlife from snakes to birds to butterflies. Notes: Boso 1 is a wonderful isolated site. The nearest site (Boso 2) is more than two kilometers away! If you want to feel alone in the African wilderness, Boso 1 is the place to be. 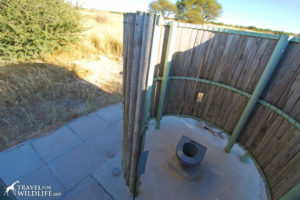 Although there is no water, the spiral shower enclosure and spiral pit toilet enclosure are in decent condition (although the toilet seat has been well-chewed by a hyena). There’s plenty of ground squirrel activity and many species of small birds visit throughout the day. There are views to Boso Pan in two directions. We stayed a few nights and loved it. The green sign at the entrance road reads “GB-1”. 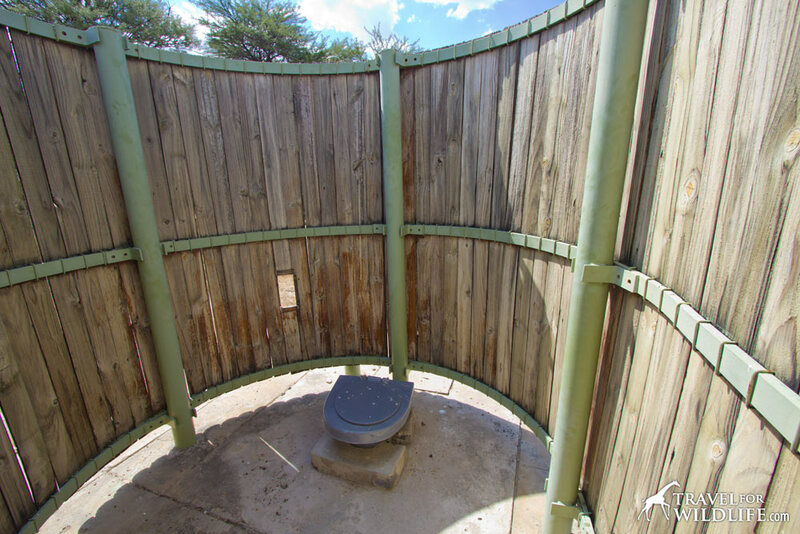 Toilet seat is well-chewed by hyenas. 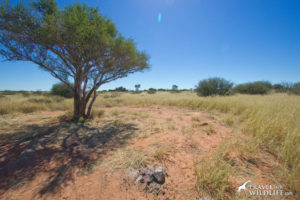 Views to Bosobogolo Pan in two directions. 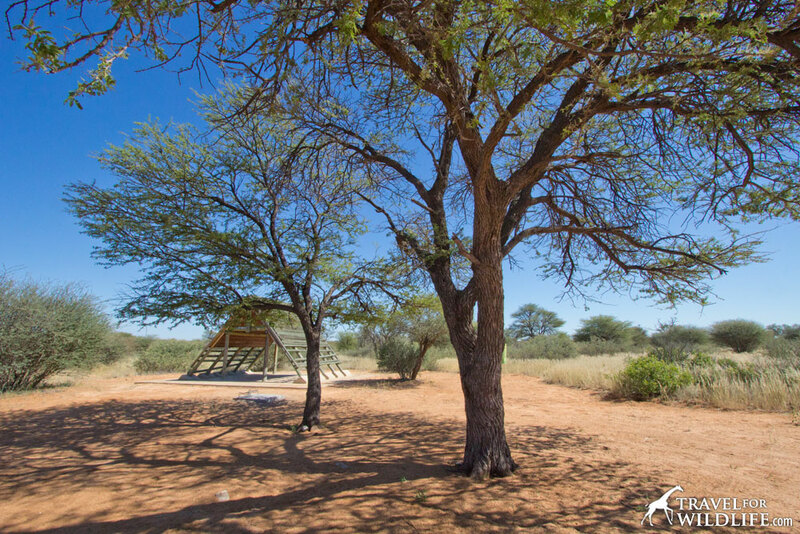 Notes: Boso 2 is a very private, isolated camp but has no facilities except an A-frame. 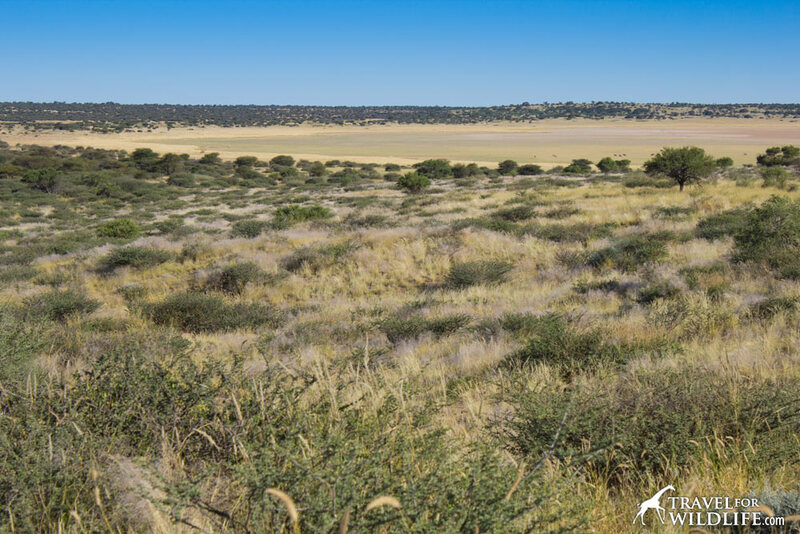 The views of Bosobogolo pan are excellent. 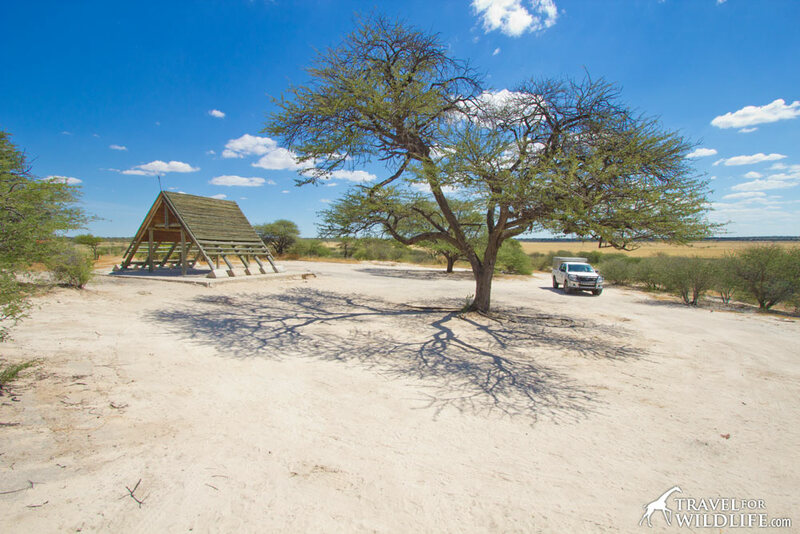 This may be the most isolated camp in all of Mabuasehube. The nearest camp is more than 2 kilometers away and the next closest after that is more than 20 kilometers! Welcome to solitude! View from back of site. 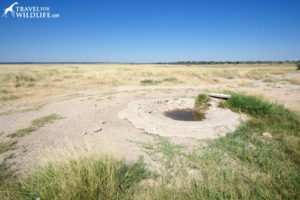 Generally referred to as “Mabua”, the Mabuasehube Pan is the namesake of the reserve. 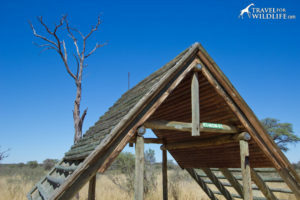 It is the largest pan in the area (slightly bigger than Mpayathutlwa) and there are great views over it from a lookout point directly to the north. 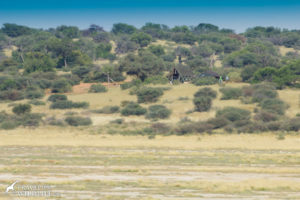 View of gemsbok in Mabuasehube Pan as seen from the overlook on the north side. 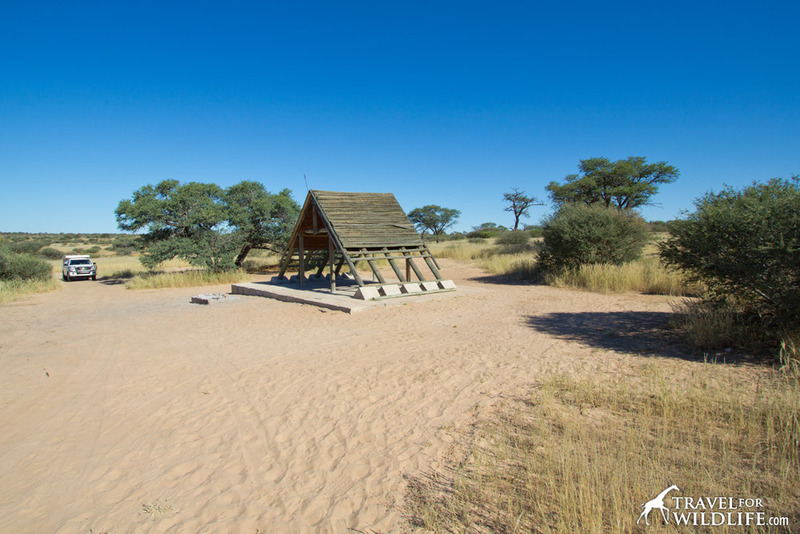 There are four campsites here, more than any other camp in the park, but none of them have water. 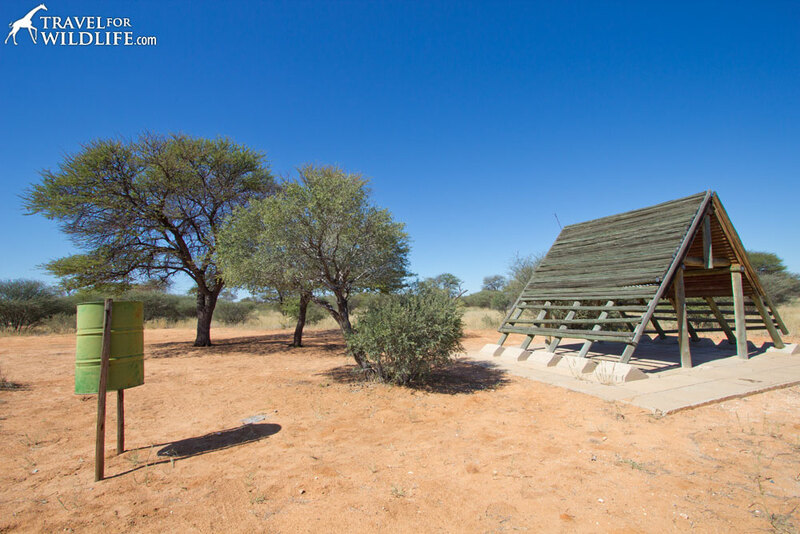 That’s because the borehole has dried up. This also means that there is no water in the Mabua Pan waterhole. 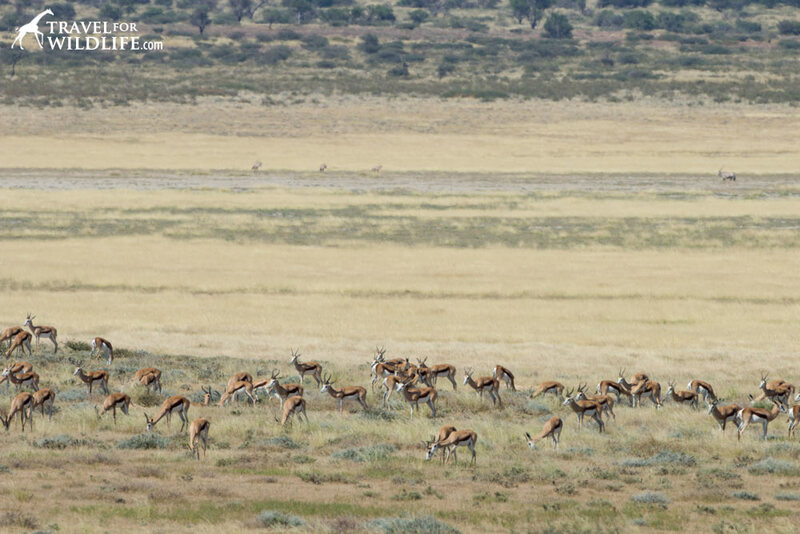 There is still plenty of game however and we saw large numbers of springbok and gemsbok during our brief visit. 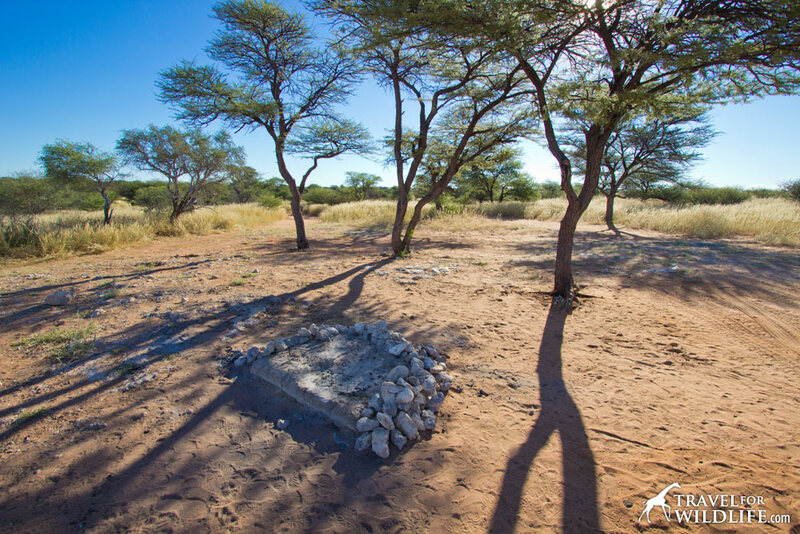 Mabua camp has the only true wilderness site (Mabua 1) with no infrastructure at all except a firepit. 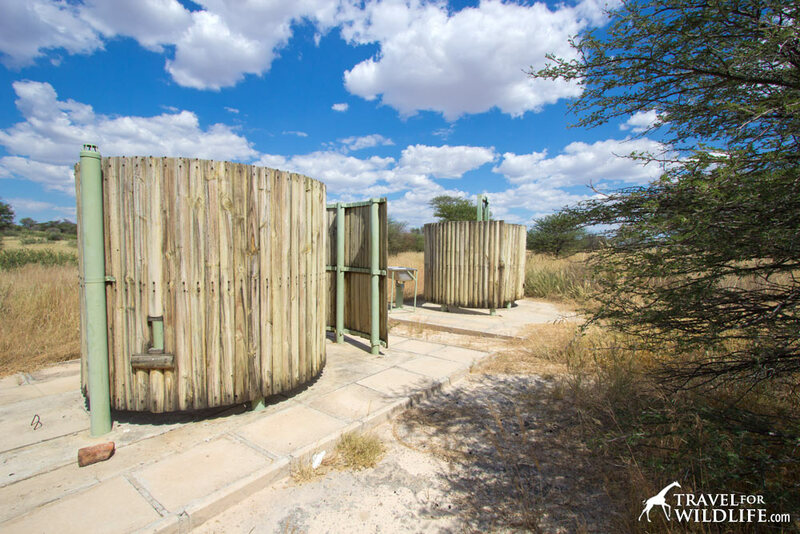 Keep in mind that sites 2 and 3 sit very close together (70 meters between A-frames) and share a pit toilet and a shower enclosure between them, but they also have the most open sweeping pan views of any site in the park. 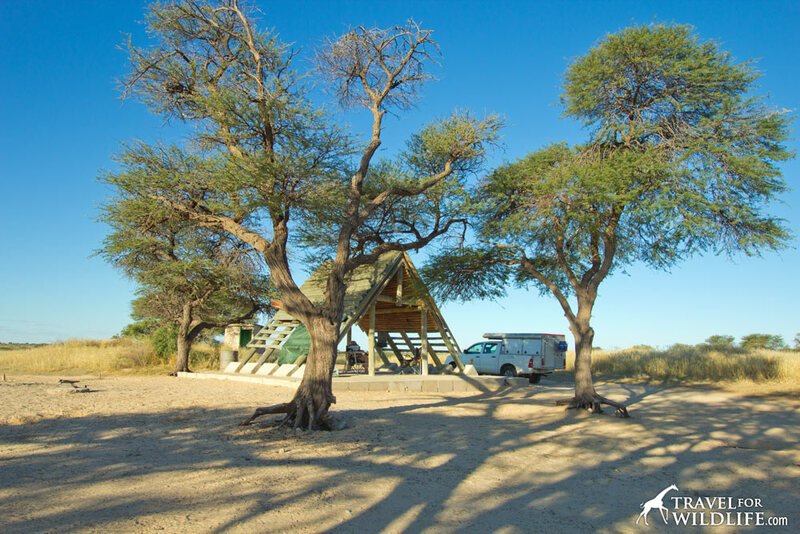 Our favorite campsite at Mabuasehube Camp is site 4. It sits by itself more than 600 meters from the nearest site (unlike 2 and 3 which are right next to each other), has a nice stone outhouse (sites 2 & 3 share a spiral pit toilet and site 1 has no toilet) and its own shower enclosure (but no water). 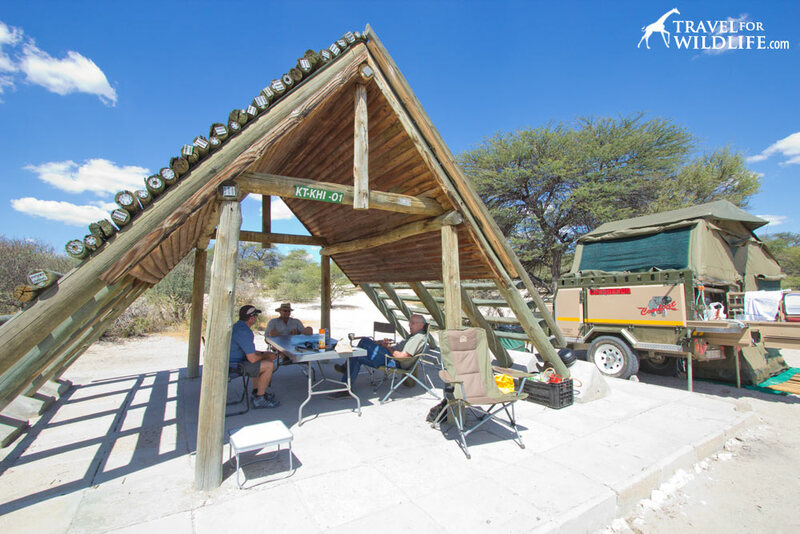 However, if you are looking for a true wilderness site with no facilities at all, then Mabua site 1 is your heaven. 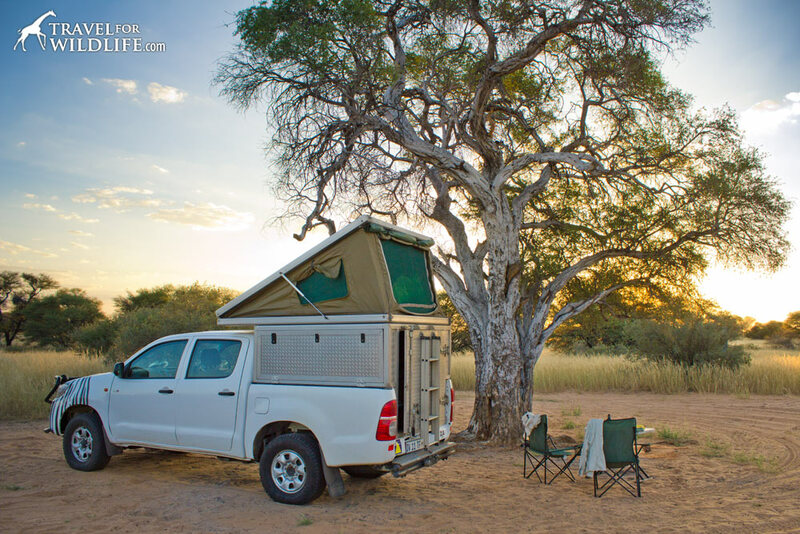 Notes: If you’re looking for a real wilderness camping experience, this is it. 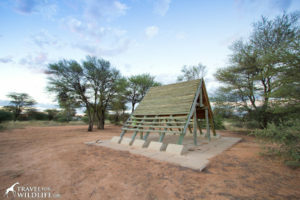 Mabua 1 is the only site in all of the Mabuasehube Reserve that doesn’t have an A-frame shelter. 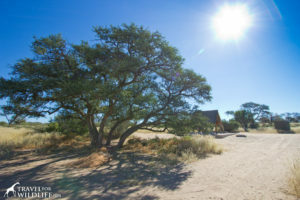 In fact, it doesn’t have anything except a firepit and some shade trees. 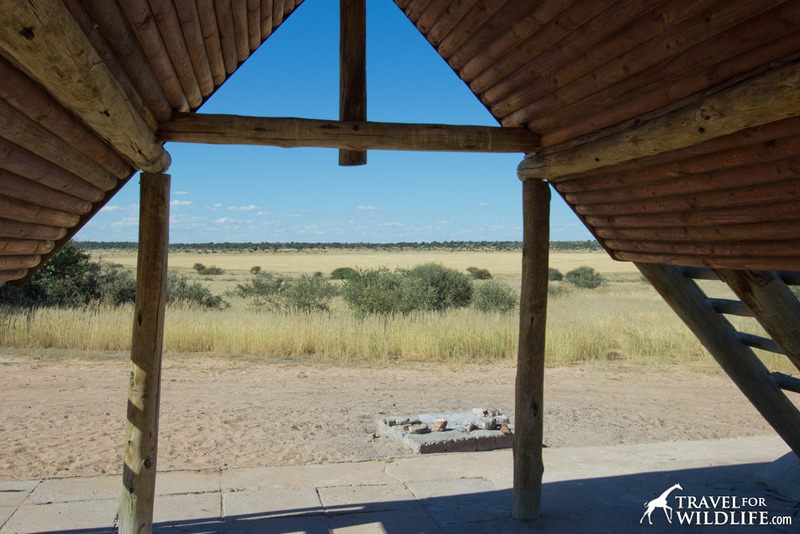 What it does have is great views of Mabuasehube Pan. 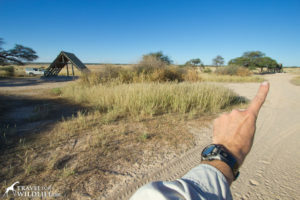 It’s also pretty remote considering the nearest site is almost a kilometer away. 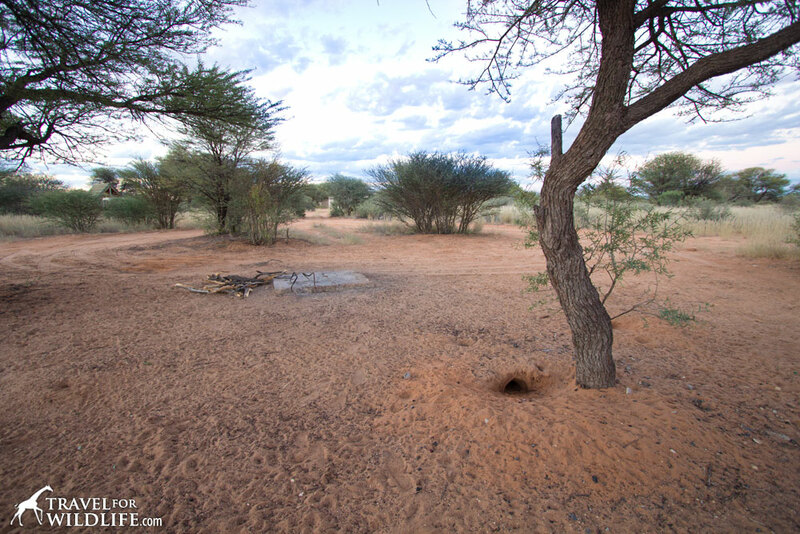 The Mabua waterhole sits just below the site but the borehole is currently dry so there is no water in it. 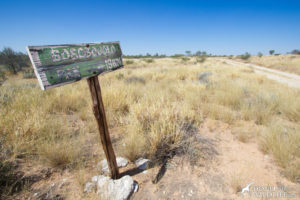 You can see in the photo below that there is a defunct road leading down to it from the site (no access allowed) but the actual road is very close by. 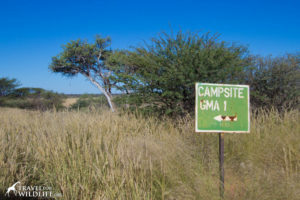 The site is only identified at the entrance by a green sign that reads “GMA1”. Notes: Mabua 2 and 3 are very similar sites that sit side by side. 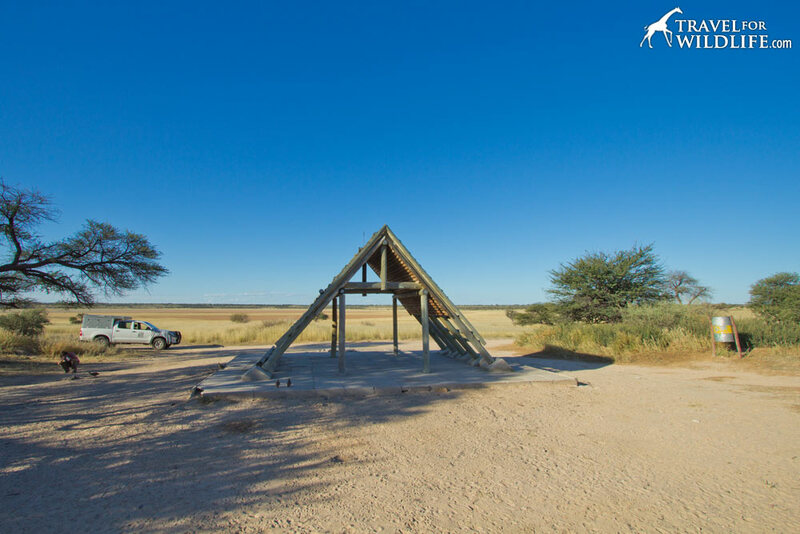 The A-frames are only 70 meters apart. There aren’t many trees between the two so you are likely to hear and see your neighbors. The only facilities are a shared spiral shower enclosure (no water) and a shared spiral pit toilet enclosure which sit half way between the two sites. 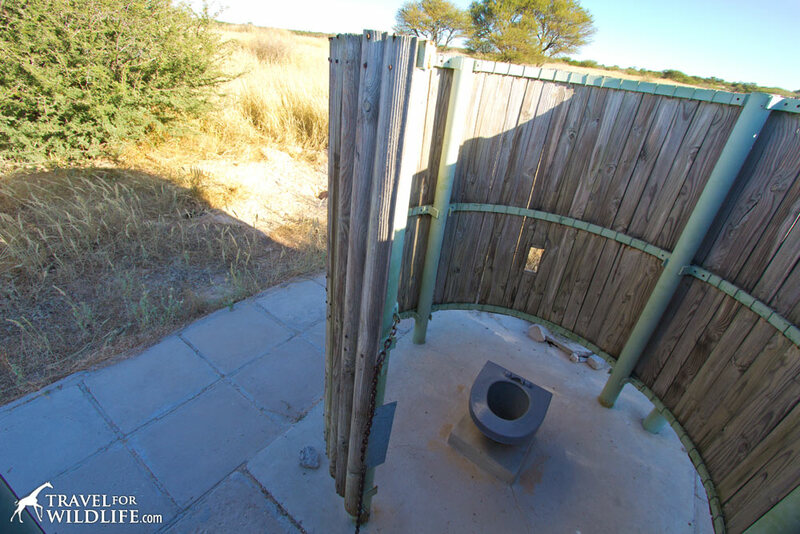 On the bright side, these sites have excellent open views of the pan. Mpayathutlwa is generally referred to as “Mpaya” because it’s impossible to pronounce. 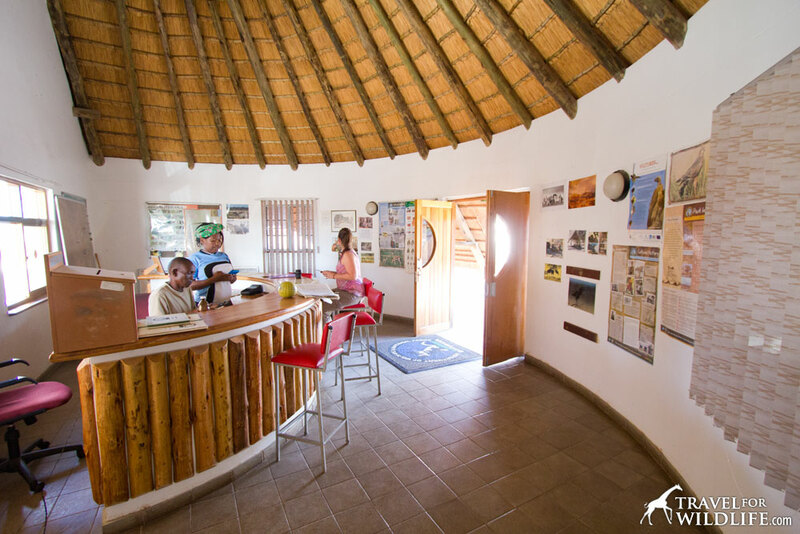 Mpaya is a large pan with a functioning waterhole and plenty of wildlife. 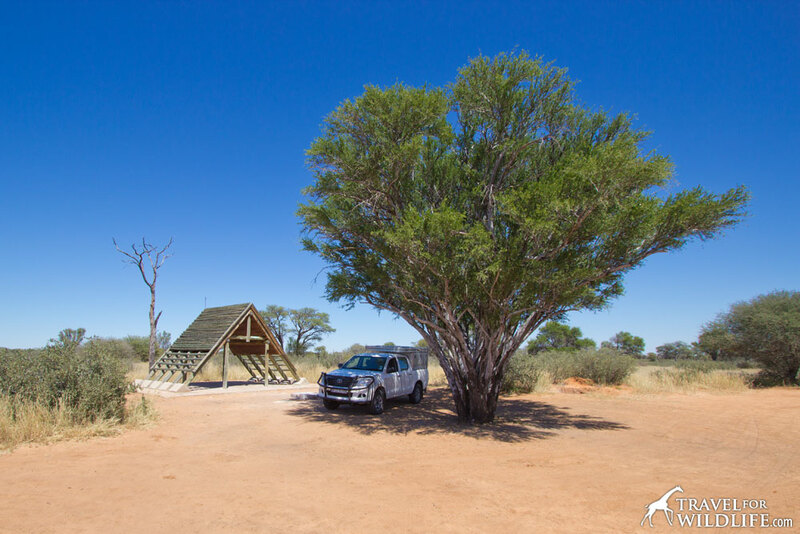 There are only two campsites that sit about 600 meters apart from each other. 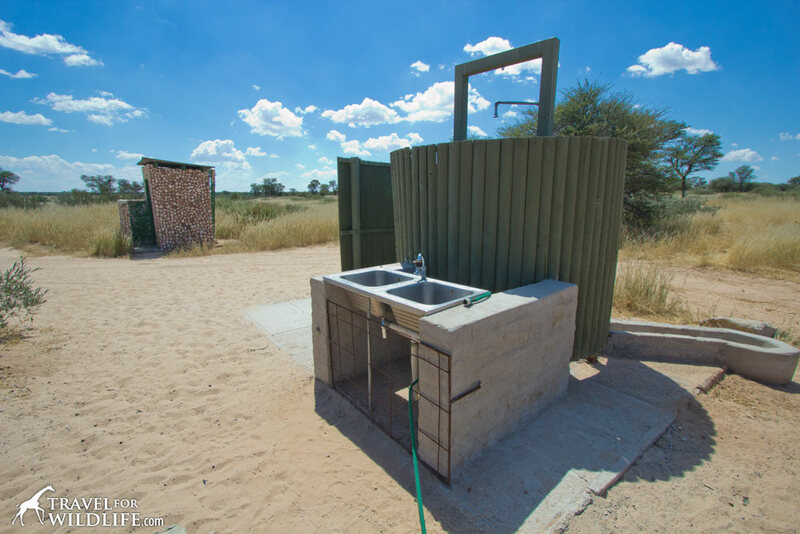 There is water available at each site, though only through a single spigot at site 2. The A-frames aren’t labeled with site numbers and there are no signs out front. If you’re trying to find your site, here are some tips. The northernmost one on the west side, with no facilities at all, is the overflow camp. 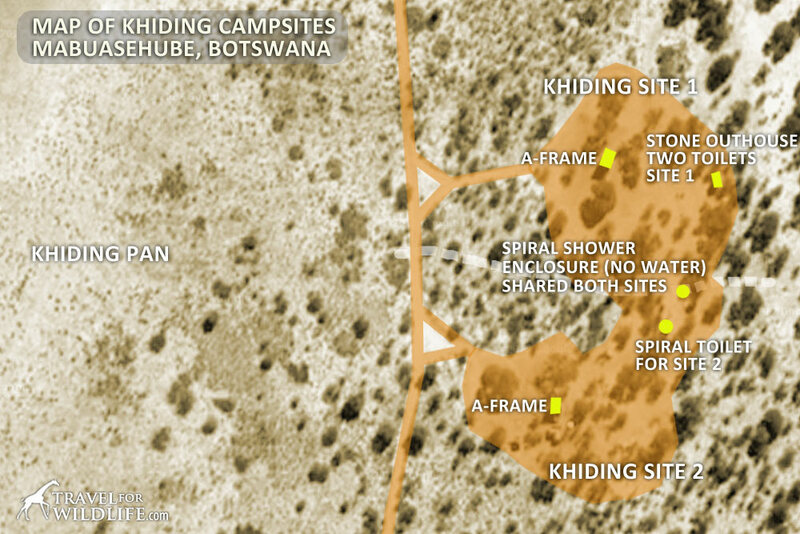 The middle one is site 1 (it has a stone latrine building and spiral shower enclosure) and the southernmost one is site 2 (it has only a spiral pit toilet enclosure and a spigot for water). The sand in the road on the west side of the pan near the camp sites can get very deep (we got stuck!) so try to keep moving through there. There is a road at the north end of the pan that runs straight south to the waterhole. 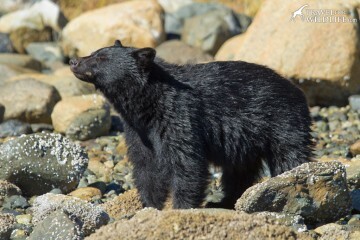 It’s a great spot for viewing wildlife. 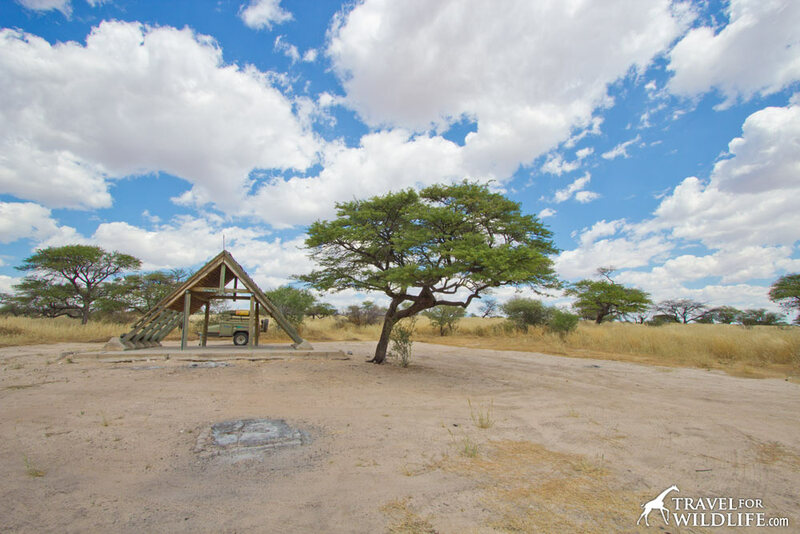 Following the same road toward the north, 600 meters after the intersection, you’ll encounter an old staff camp (sometimes referred to as the scout camp). I have no idea if it is currently in use. We didn’t see any people or vehicles there. 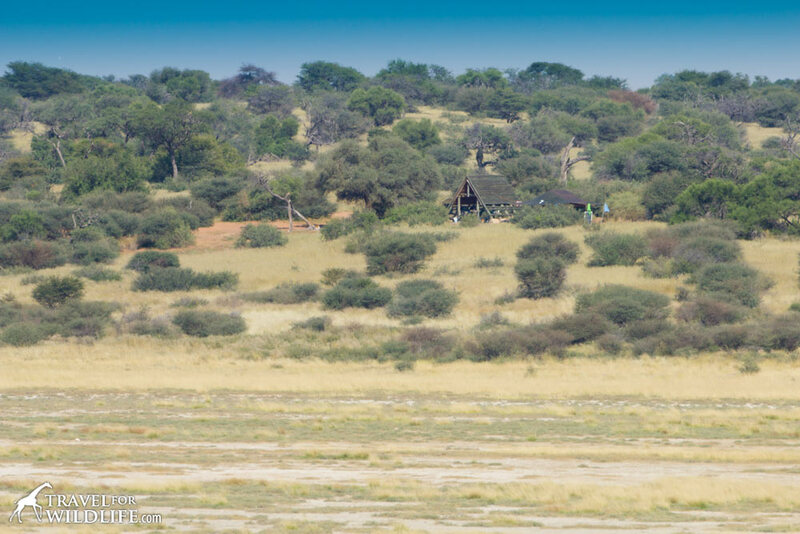 Lions are occasionally sighted lying in the shade of the buildings, even though there is a fence around it! 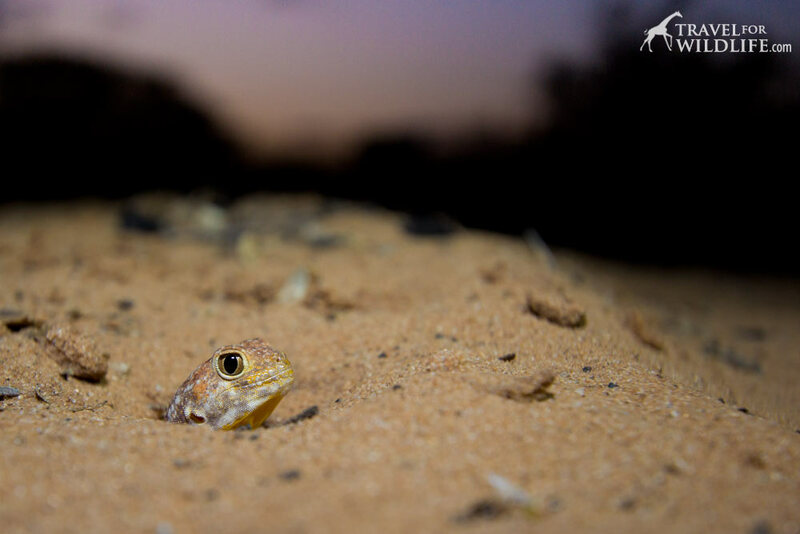 The sand is very deep here too so be careful. 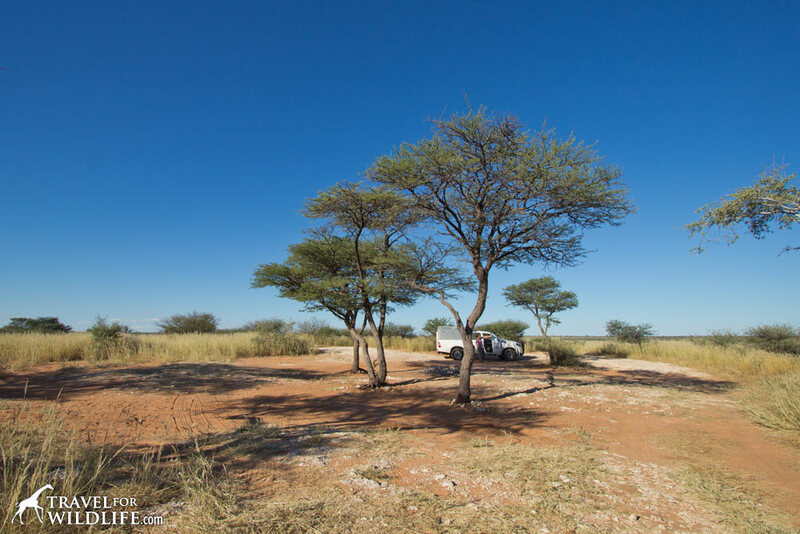 Our favorite campsite at Mpayathutlwa is site 1. Although it sits a little too close to the road, it has far better facilities than site 2, including a shower with water and a functioning sink! It also has a nice stone outhouse (pit toilet) and great views. 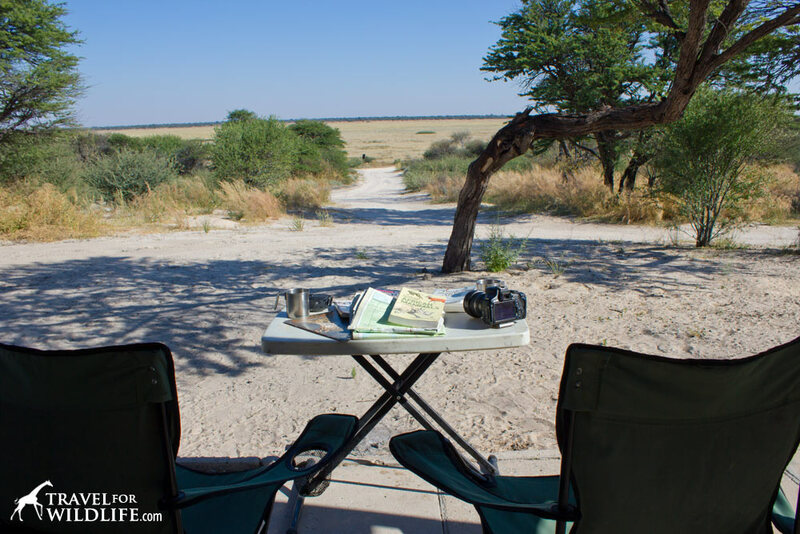 Notes: Mpaya 1 has all the amenities you could want plus a nice view of the pan. 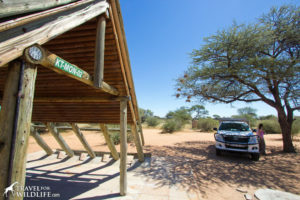 Perhaps the only drawback is that it sits very close to the intersection between the loop road around the pan and the road to Khiding making it feel a bit less private. 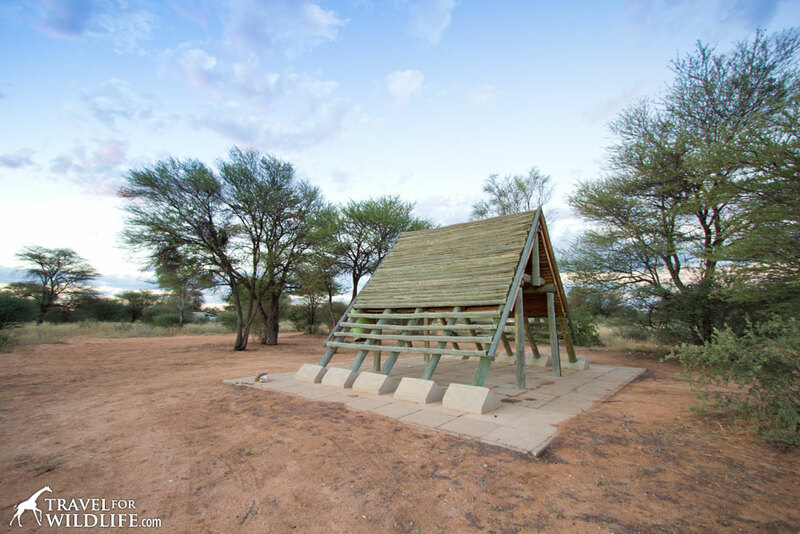 The Mpayathutlwa 1 campsite, managed by Inter-Tourism Group, has a stone outhouse and shower with running water! 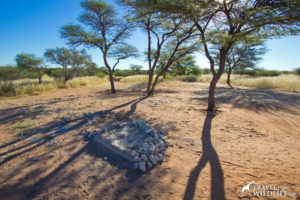 Mpayathutlwa site 2 (KT-MPA-02) in Mabusehube. Note the water spigot in the foreground! 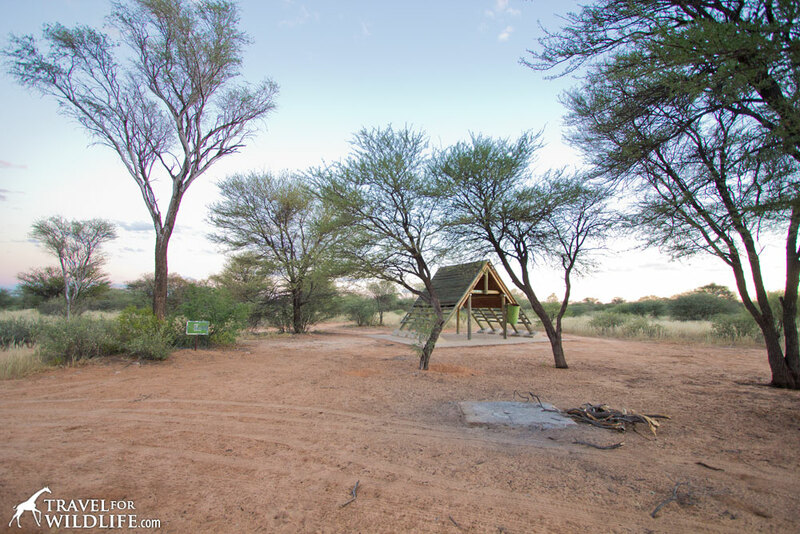 Notes: Mpaya 2 is a large, wide open site with panoramic views of Mpayathutlwa Pan. It has only two trees and otherwise very little cover. 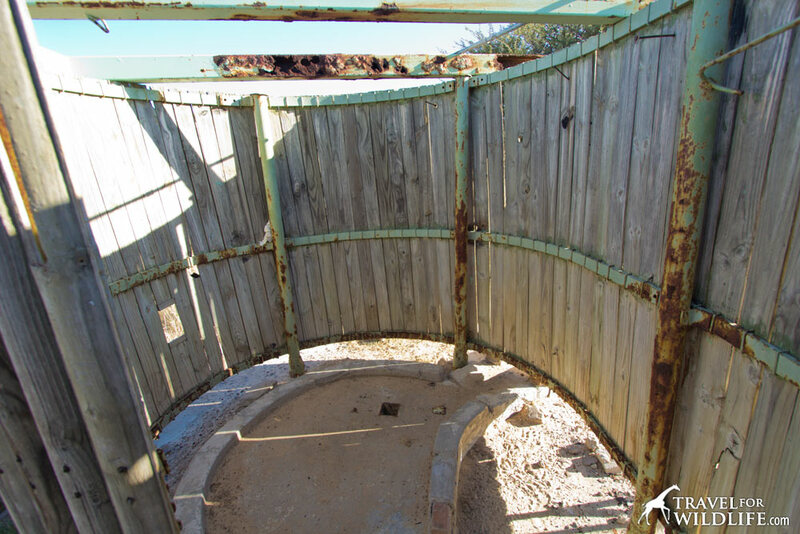 It has no shower or sink but it does have a water supply coming from a spigot in the ground in front of the A-frame. The spiral pit toilet enclosure and side road leading from site 1. The small sign at the entrance reads GMP Work Camp and some maps label this is an overflow camp. I’m not really sure how it will be used now that Mpaya has been privatized. 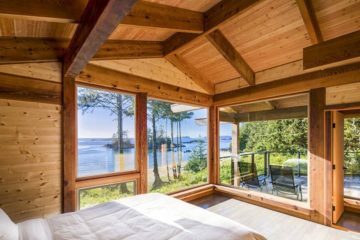 As far as I know this is not a site you can book. 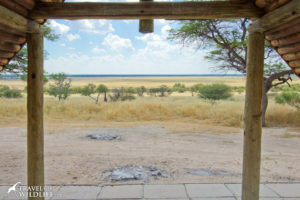 The site has no facilities at all (not even a firepit) but it does have a fair view. 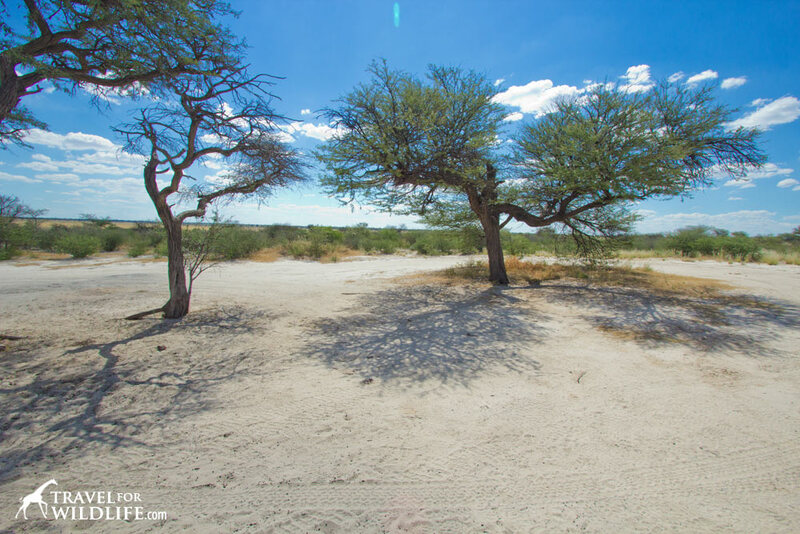 These sites are park-managed and are booked through Botswana Department of Wildlife and National Parks (BDWNP). 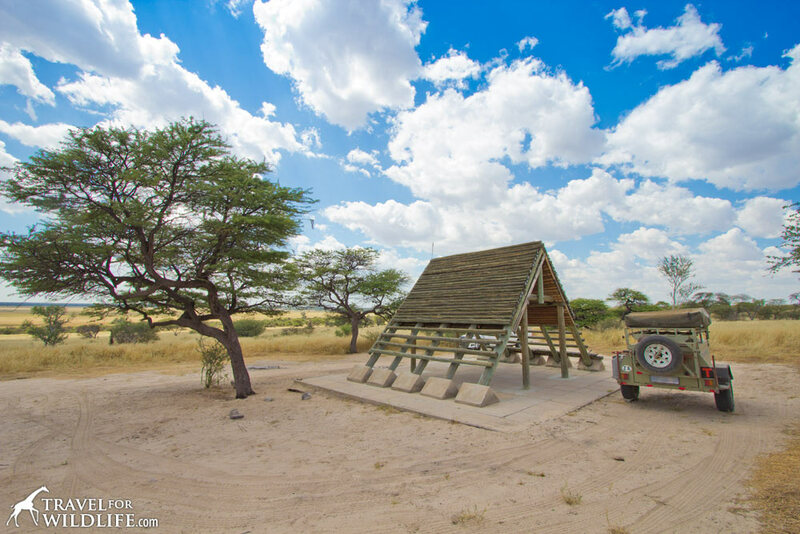 The Matopi campsites are not technically inside the Mabuasehube area, but if you’re driving in from the South Africa side (at Nossob) along the Bosobogolo Trail (aka Boso Trail) then this is a good place to camp along the way. 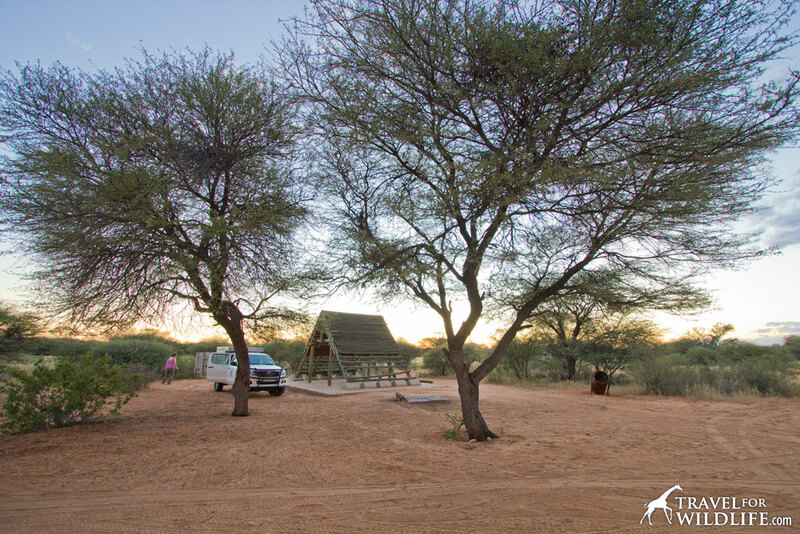 There are only two campsites that sit about 10 km apart from each other (site 1 to the west and site 2 to the east), which makes them even more remote than any of the Mabuasehube campsites. 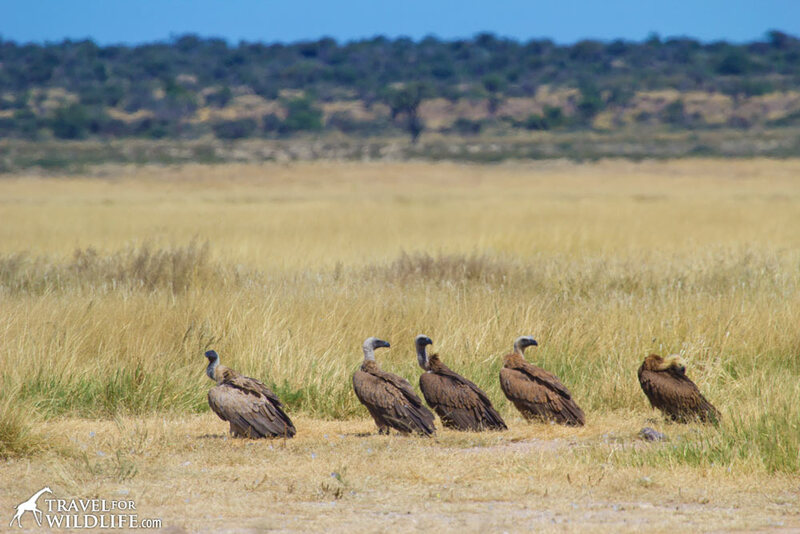 But unlike the Mabua sites, these don’t sit next to a pan. Rather they are plopped in the middle of the wilderness. 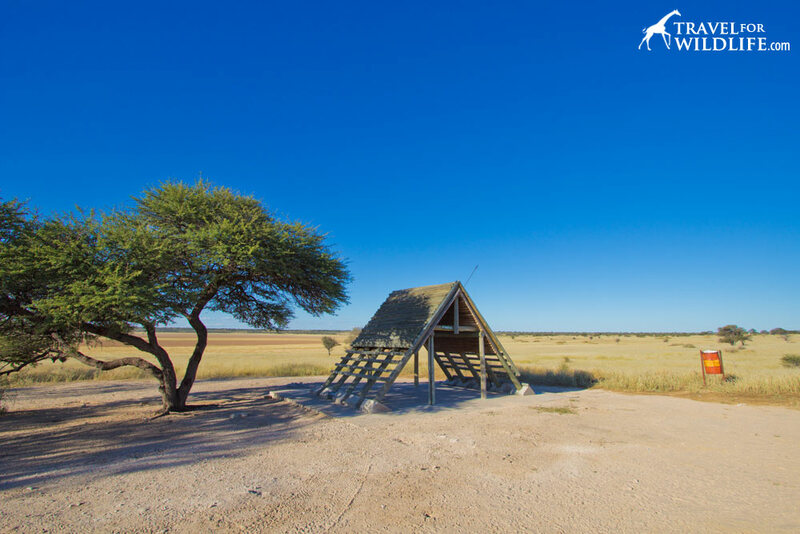 Since these sites are designed as a stopover, they can only be reserved for one night. Which is just as well, it’s not really a great place to drive around and sight-see. 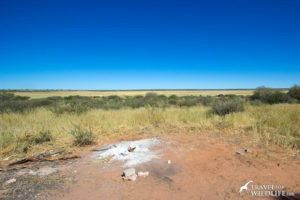 However there is a small pan that sits between the two sites, about two kilometers from Matopi 2 (the site to the east). There is a pullout at an overlook on the east side of the pan and this is about the only potential driving destination in the neighborhood. 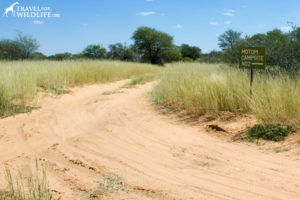 Otherwise this single track road functions only as two-way highway between Nossob and Bosobogolo Pan. As such, you must be careful to watch out for oncoming traffic, especially when cresting the many dunes at the western end of the trail. 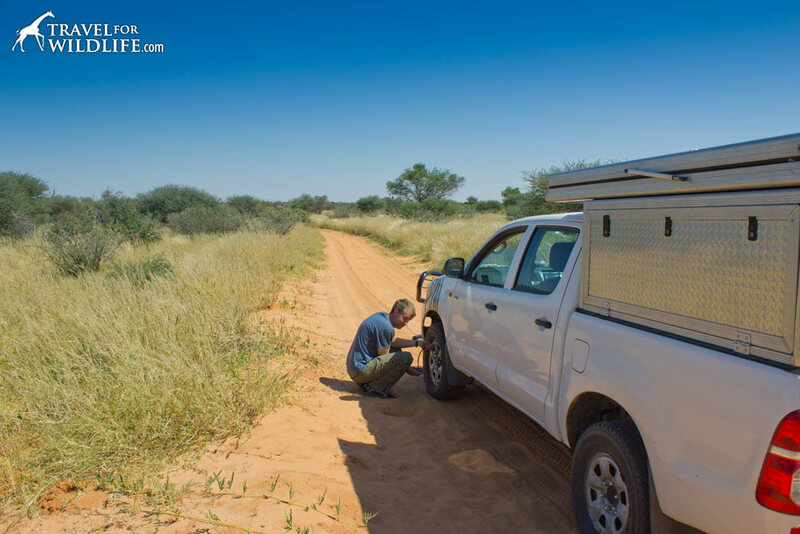 We were a little nervous about this drive, not having much experience in 4×4 sand driving but we did fine following one simple rule: keep moving when the sand is deep or heading up a dune. Keep that tire pressure low when crossing the Boso Trail! 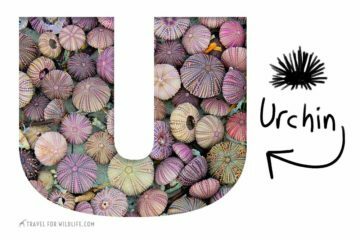 Again you will notice some inconsistencies in spelling here. Most maps refer to them as Matopi, but occasionally you’ll see Motopi. 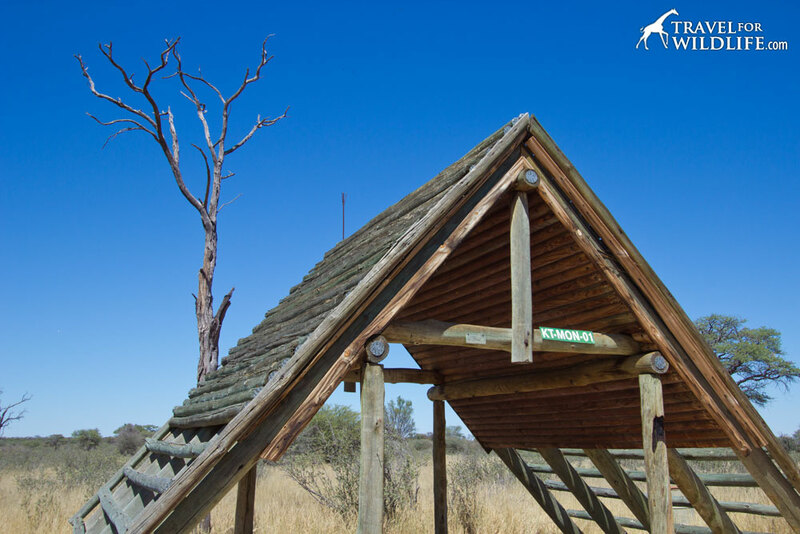 Although the official park maps label them Matopi, the campsite codes are KT-MOT-01 and 02. 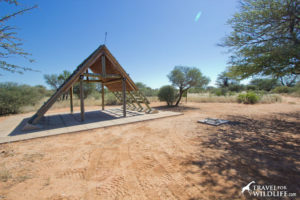 The sites have no A-frame and there is no water available but each one has a pit toilet in a cinderblock structure and at least one shade tree. Notes: Matopi 1 has only a single shade tree in the main camping area near the toilet, but there is a large additional area behind it with more shade trees, making it ideal for groups with multiple vehicles. 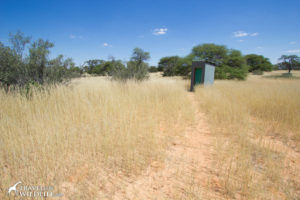 The cement outhouse building is set back from the clearing a bit and the walk can be a little creepy when the grass is high on each side of the path. 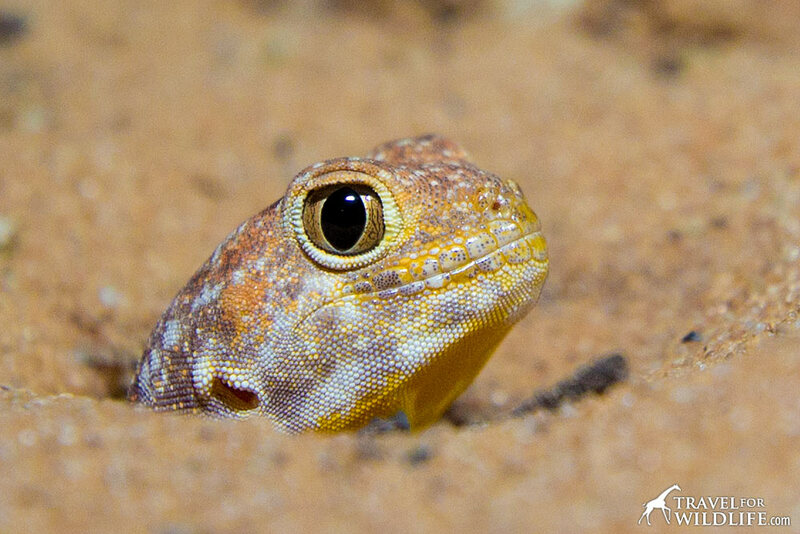 The barking gecko activity is awesome right in camp and this is the first time I successfully photographed some! 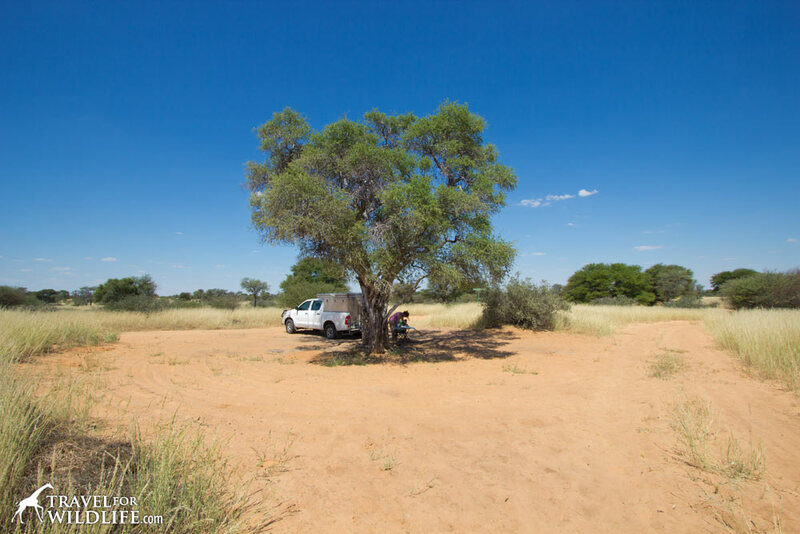 Notes: Matopi 2 has only a single shade tree in the middle of an otherwise open site. The only other facility is a block outhouse with pit toilet. 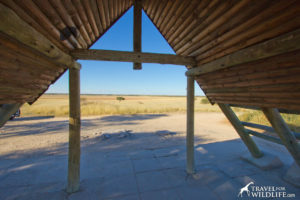 There is a small pan that sits 2 kilometers to the west with a little pullout and viewpoint if you’re looking for a short outing. This site has a sign at the road that reads “Motopi Campsite No 2” at the road and one inside the site reading “KT-MOT-02”. 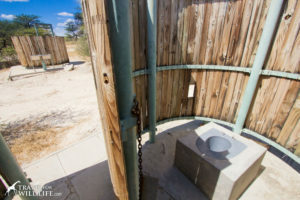 The cement outhouse with pit toilet. 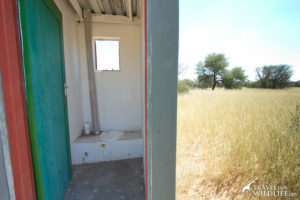 I have to admit, I enjoyed the view sitting in this outhouse. Did you enjoy the article? Pin it! 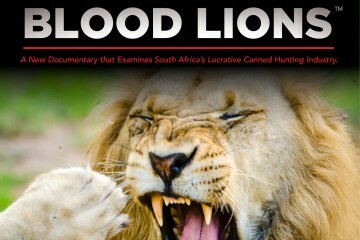 Next ArticleWhat Do Lions Eat? 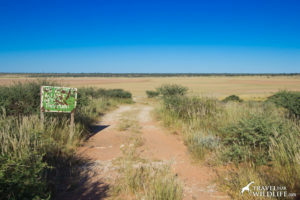 Thanks for compiling this great guide to Mabua, im sure it Will be very helpfull to a lot of folk when planning a visit to the park. Fantastic guide for this place. Love it and will bookmark it for sure. 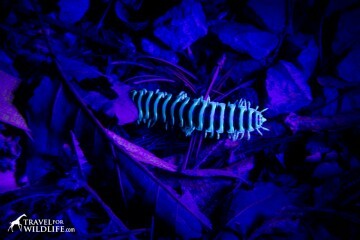 That’s something I need for the future for my nature photography. Thanks so much that you put so much effort into this. 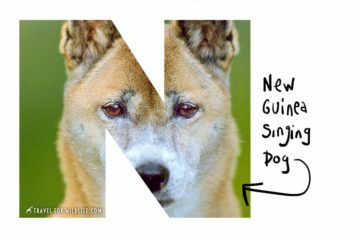 A very helpful guide. 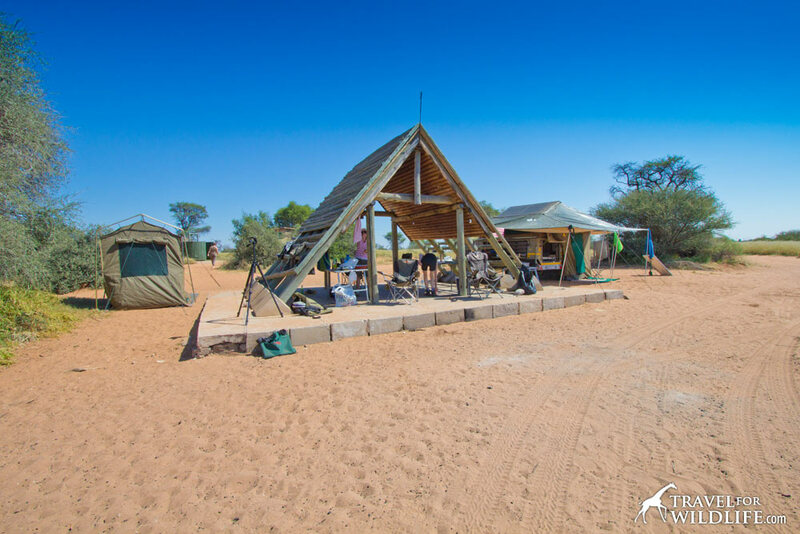 Wow great work, we have been having problem with describing each camp for our clients, now you have just made everything simple!!! Good work and I wish you all the best… keep going!! Thanks for the great reviews Hal. 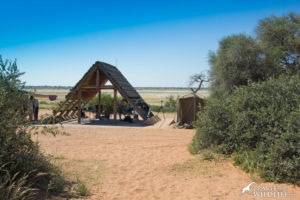 A note : The third Mpaya campsite can be booked, (Called Mpaya-Reserve on the Vouchers) but it is used mainly as an overflow site. 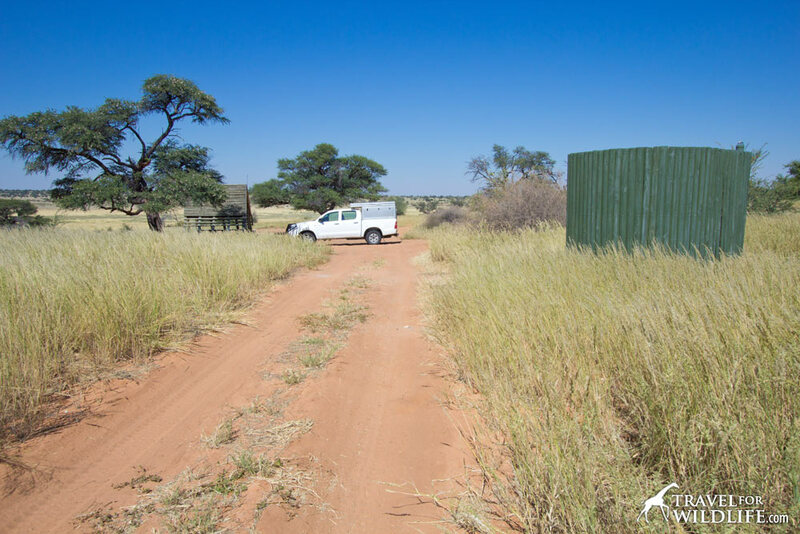 Just want to say that we have been camping at the Entrance gate on the 4th and 5th July, no water, no ablution facilities, nothing!! All they say is “sorry, no water”! 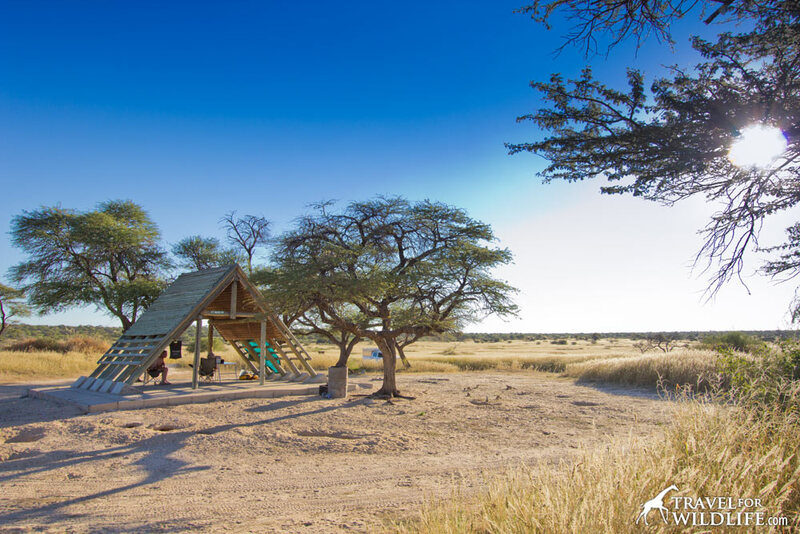 Thank you do much for all the effort you put in for people like myself who would love to live this dream and one day have opportunity to travel to Botswana and stay at one of these places. It would be a dream come true. 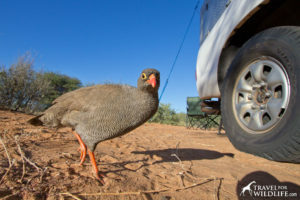 I’m a South African living in Australia and I so miss the wildlife of Africa. You’ve given us all so much important information. Greatly appreciate people like you. 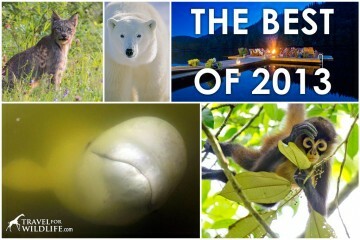 Best wishes and God bless.? Thanks so much for putting this together. It assisted in our planning very much. 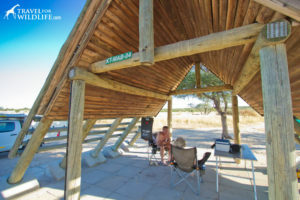 Only comment is perhaps to put up a disclaimer that while the campsites listed with water are supposed to have it, it’s not guaranteed. 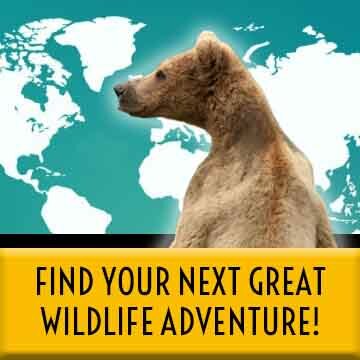 Perhaps best to plan a minimum daily allowance of washing water or extra fuel to go and find it. Woww , Christinah thanks for your unselfish sharing of user friendly and useful information, Your pieces of writings are always specicific and detailed. What a wonderful guide. Thank you so much. Our take on camping in the Botswana side of the Kgalagadi is expect no wate. If you get there and you have water then it is a bonus! !